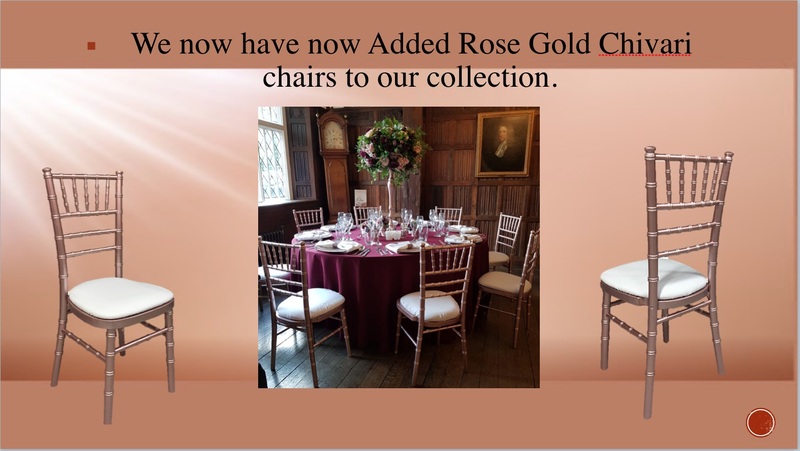 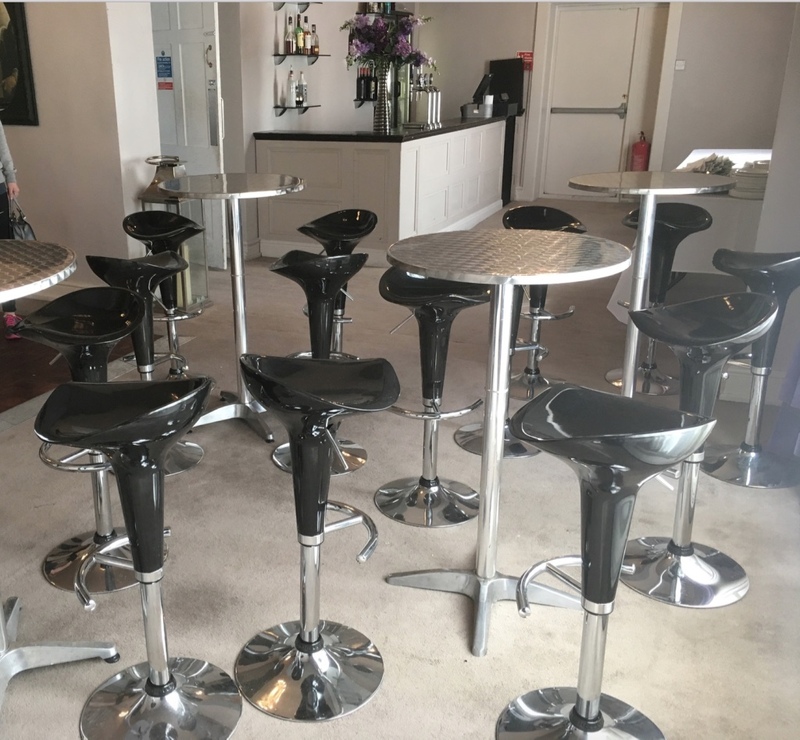 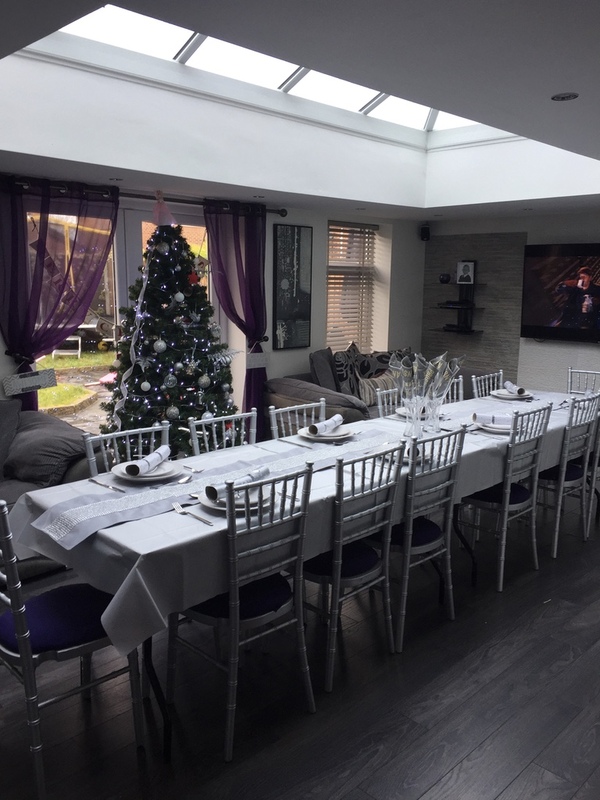 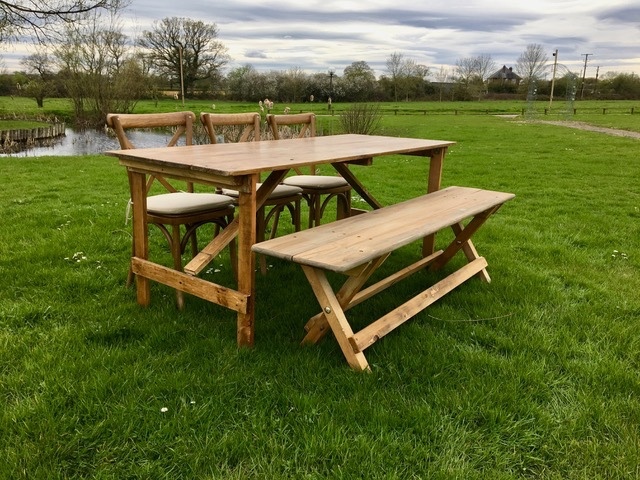 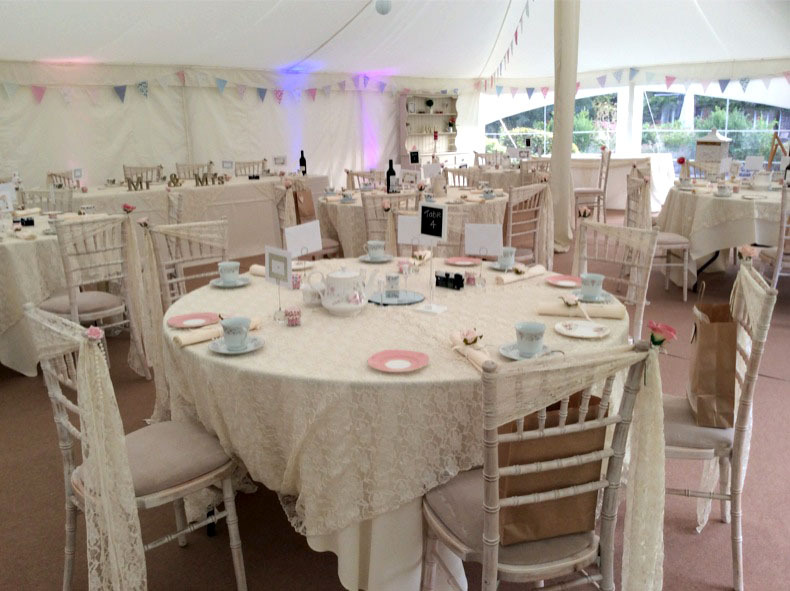 We have various types of chair, and we have a range of high quality banqueting chairs to suit every occasion, available with a choice of coloured seat pad, to blend in with your overall colour scheme.﻿ We also offer a selection of tables. 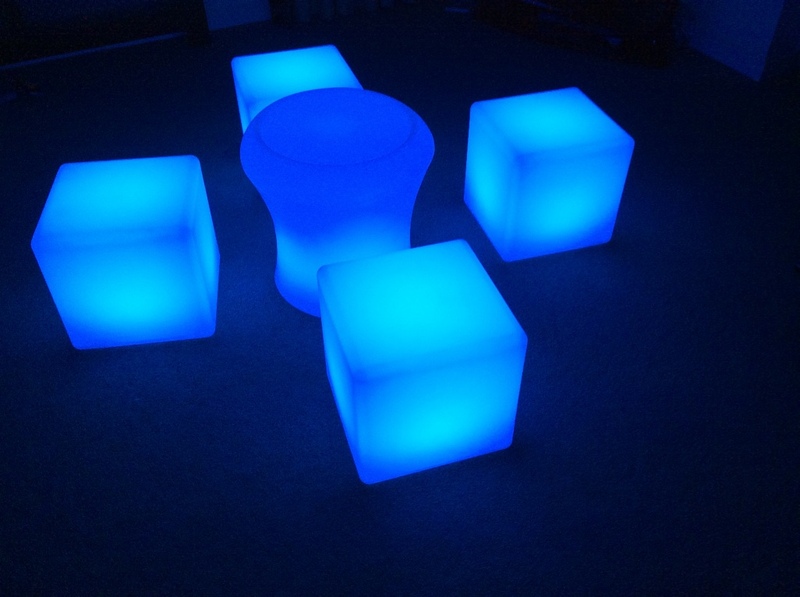 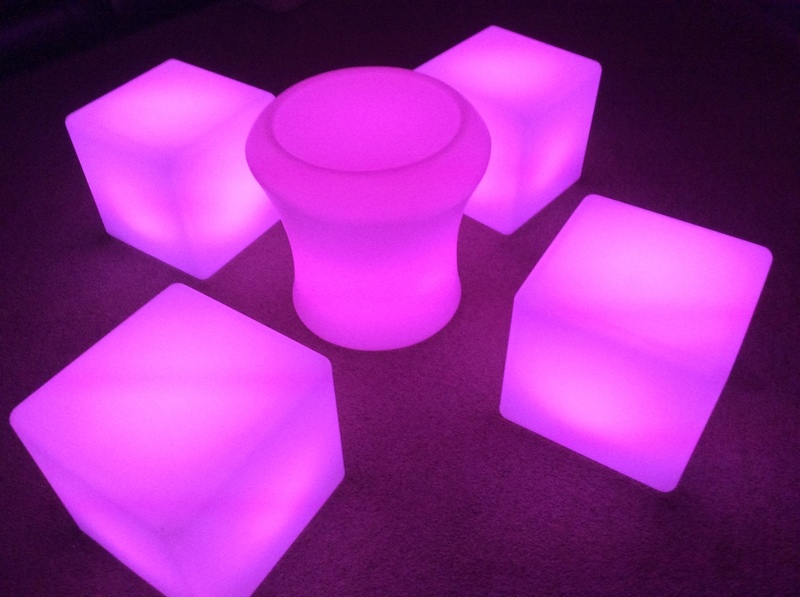 We offer a full range of furniture, including tables, chairs, lounge furniture and LED funky. 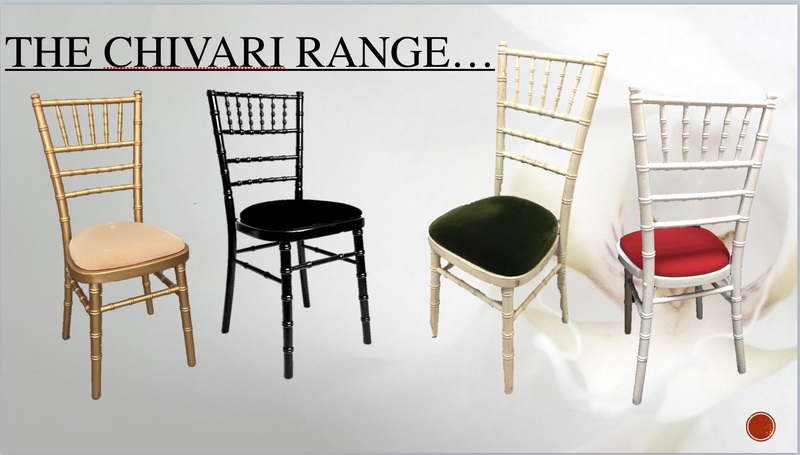 From the traditional style banqueting chair, to the newer Chivari, and vintage style Oak Cross Back, we have a chair to suit your occasion and venue. 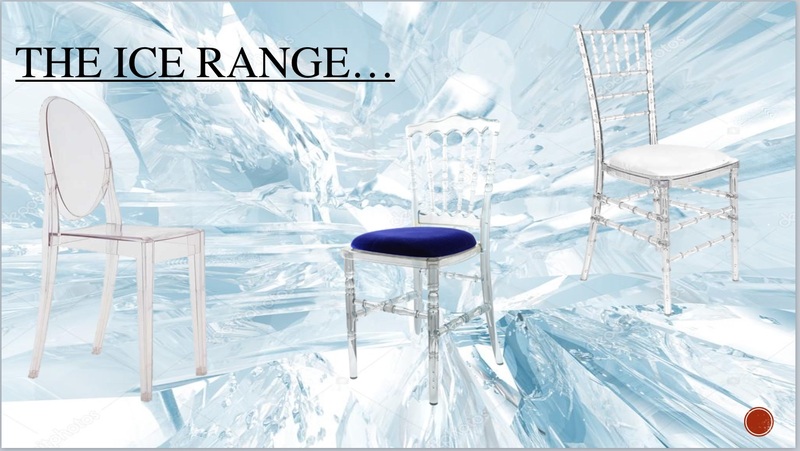 The majority of our chairs have a changeable seat pad, and there are over 24 different colour pads to choose from. 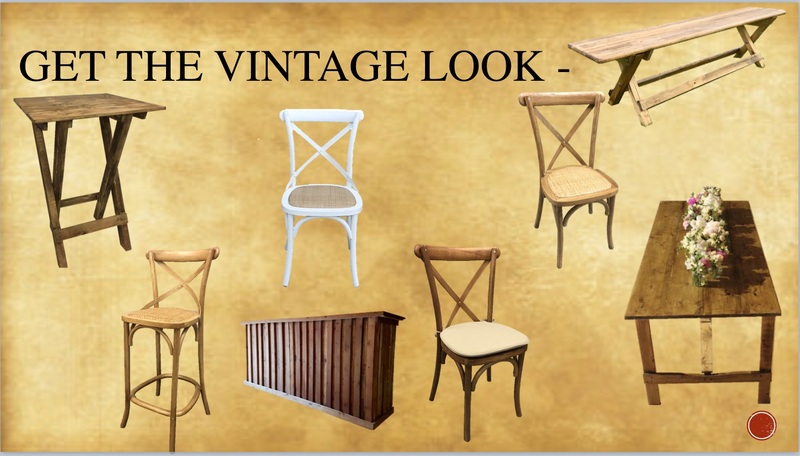 In addition to the normal style round and trestle tables, we also offer a "Vintage style trestle" to fit in if that is your chosen theme. 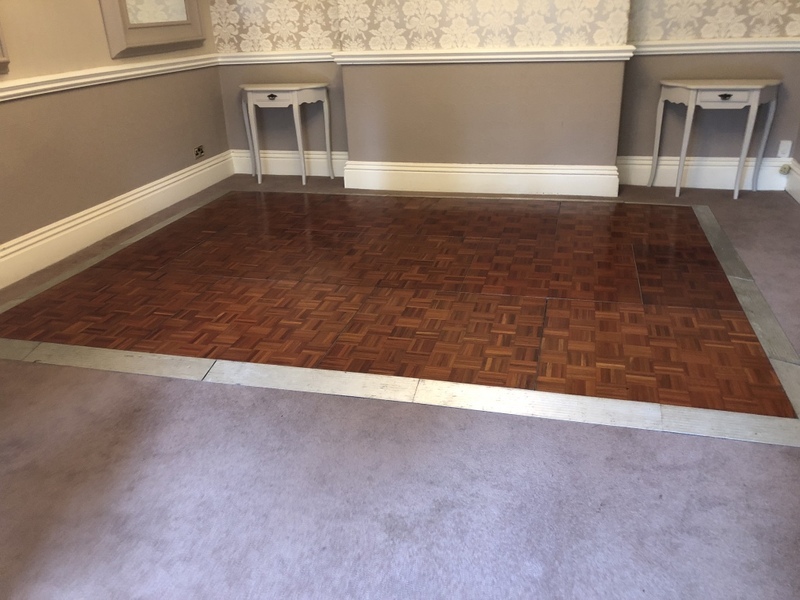 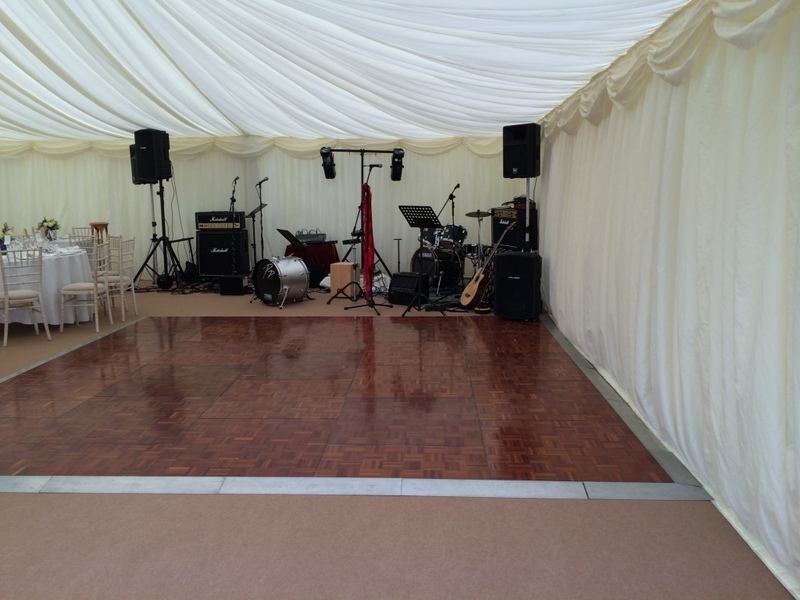 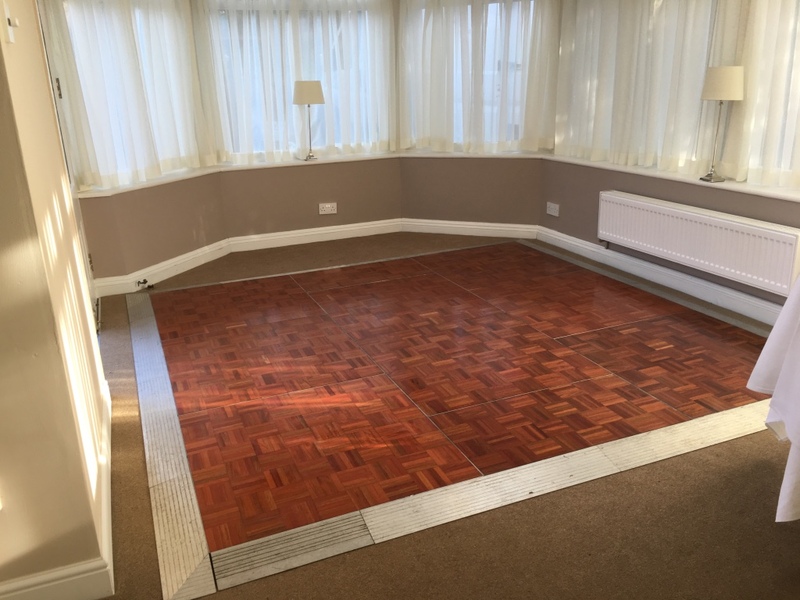 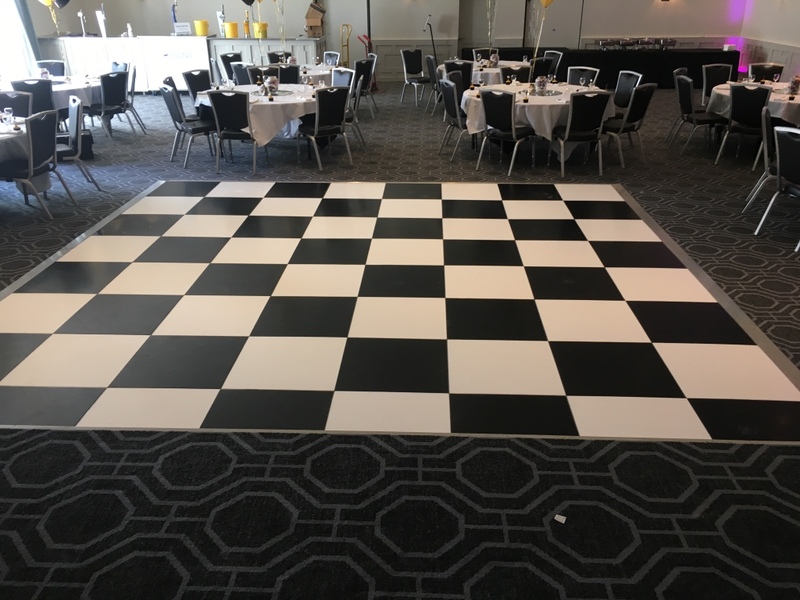 We are happy to hire dance floors not only to our marquee clients, but also to venues, hotels, and event organisers. 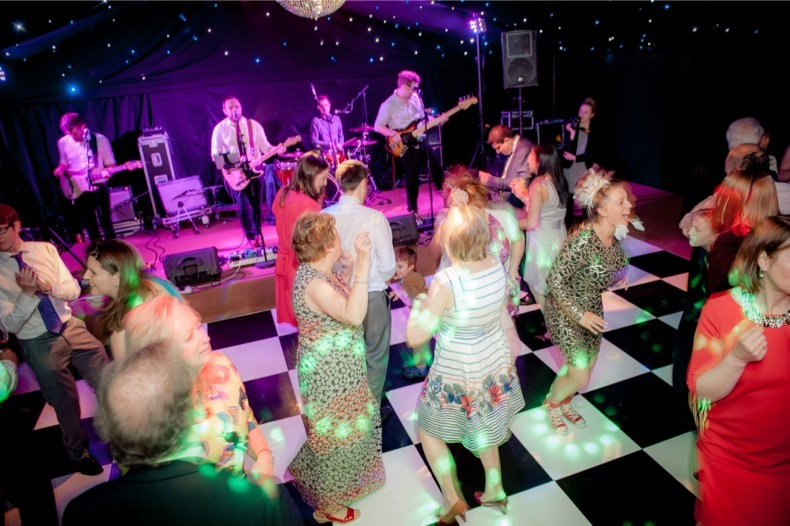 From a one night event, to long term hire, we have the dance floor and price to suit you. 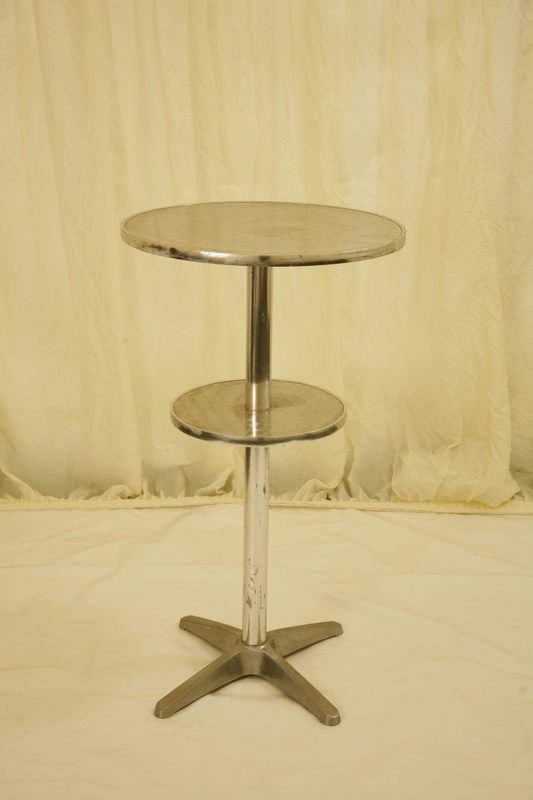 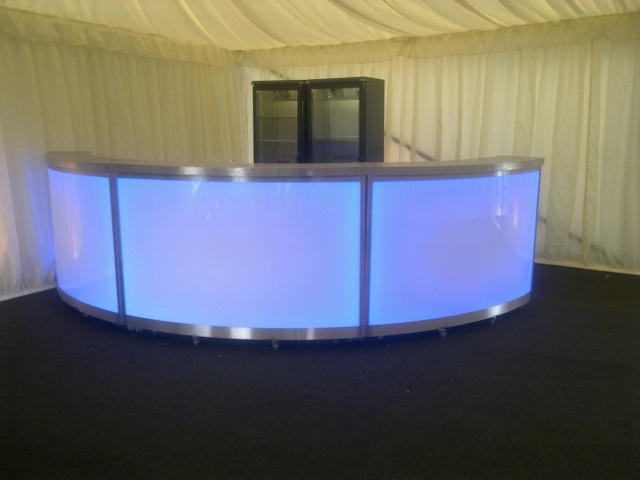 We also provide a full range of ancillary items to compliment your event. 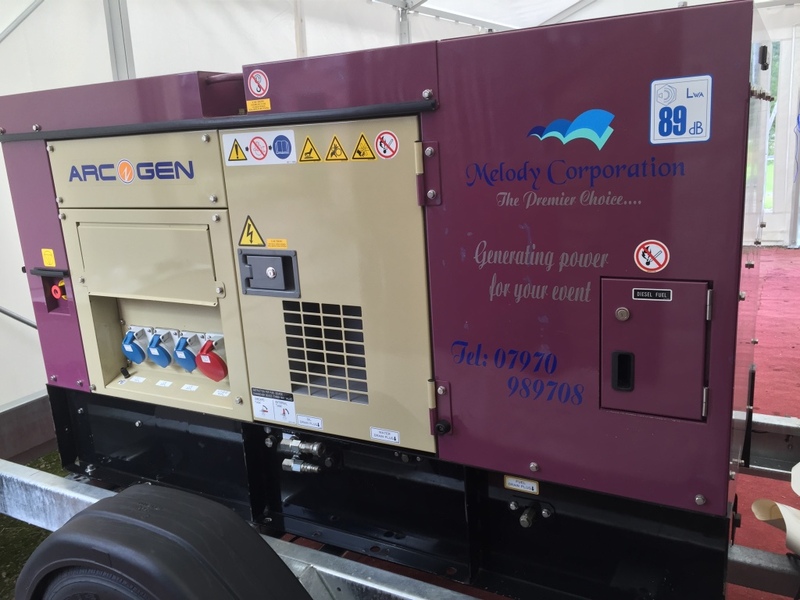 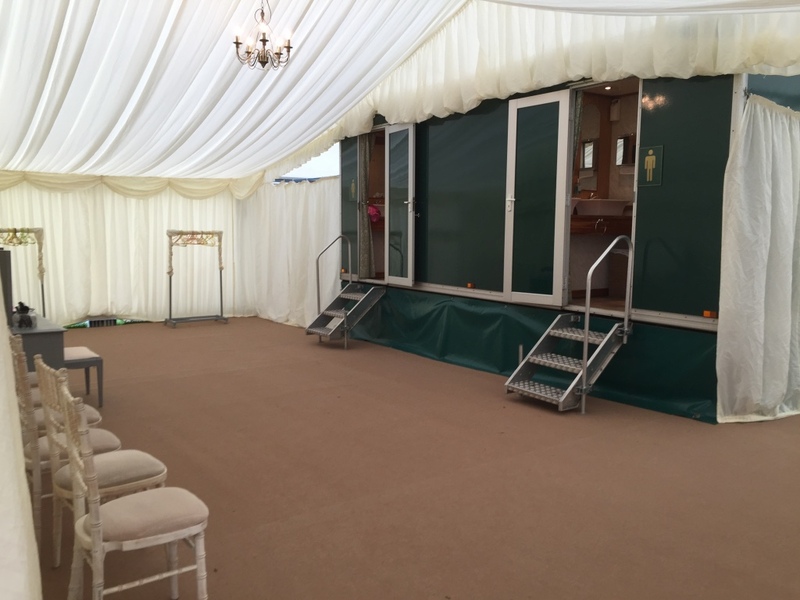 These include heaters, furniture, PA, Sound & Lighting, Trackway, standard and luxury toilets, staging, Generators and full power distribution. 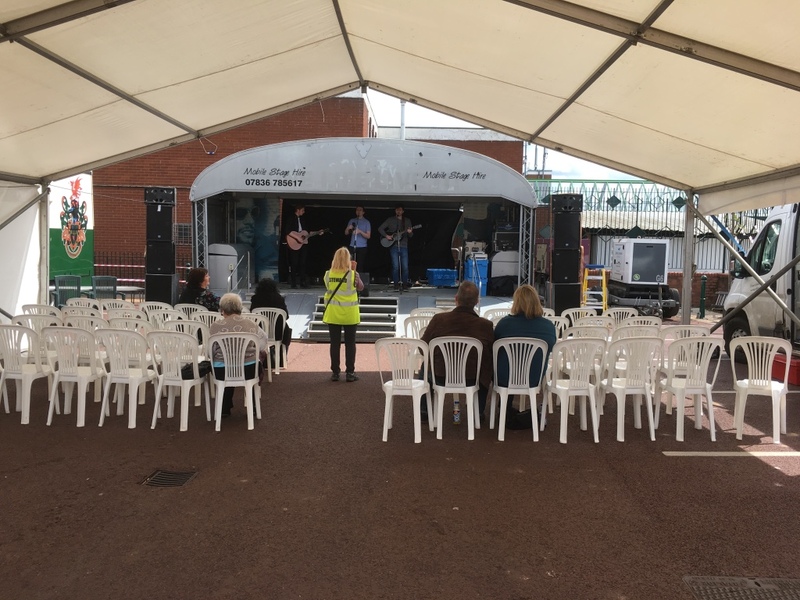 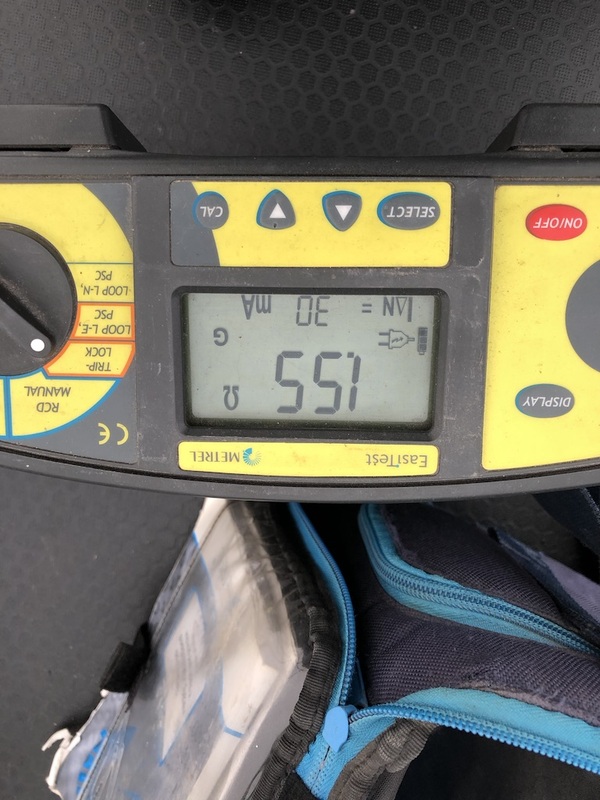 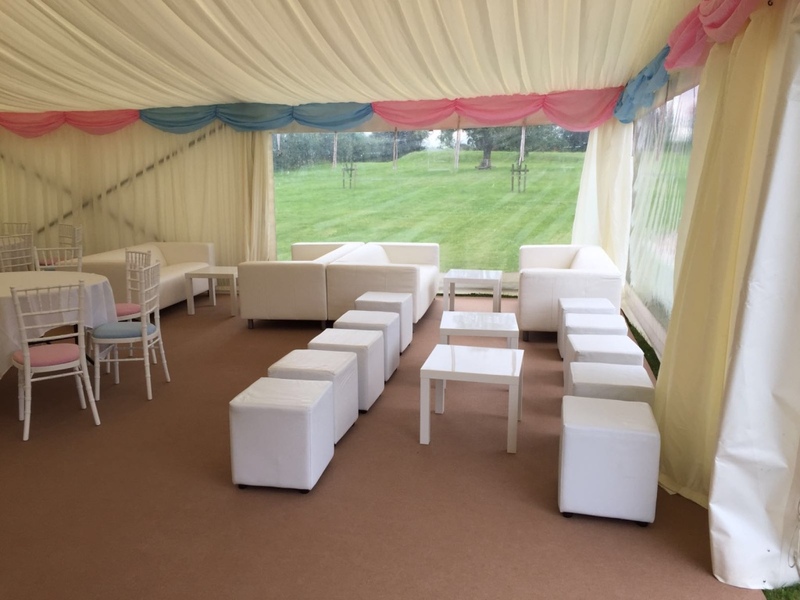 We are fully compliant with the electrcial standard BS7909, and unlike many other marquee and event companies we do this ourselves and do not employ sub contractors. 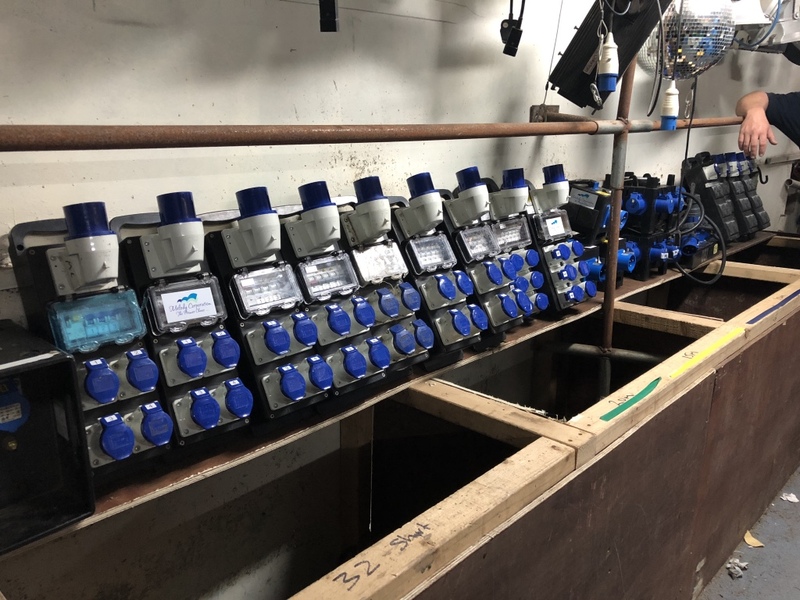 We can provide electrical design documentation should this be a requirement, and on completion of installation a certificate can be issued. 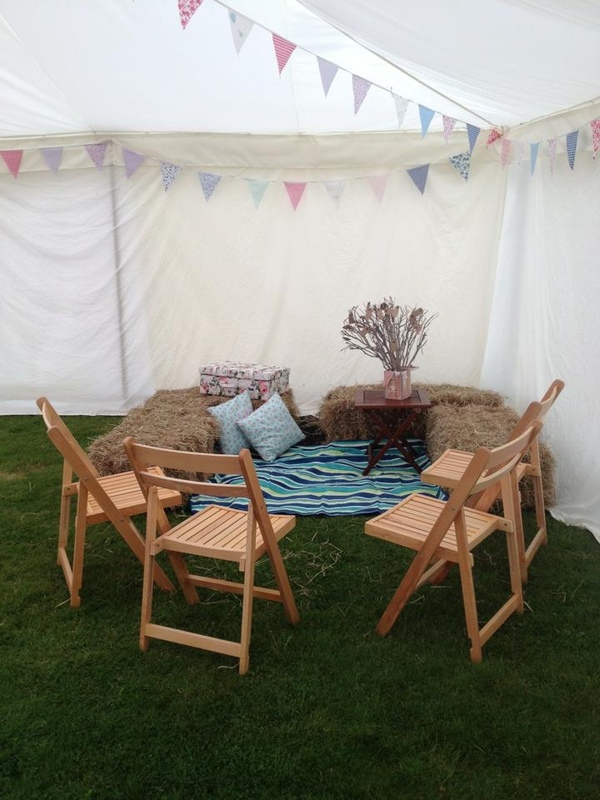 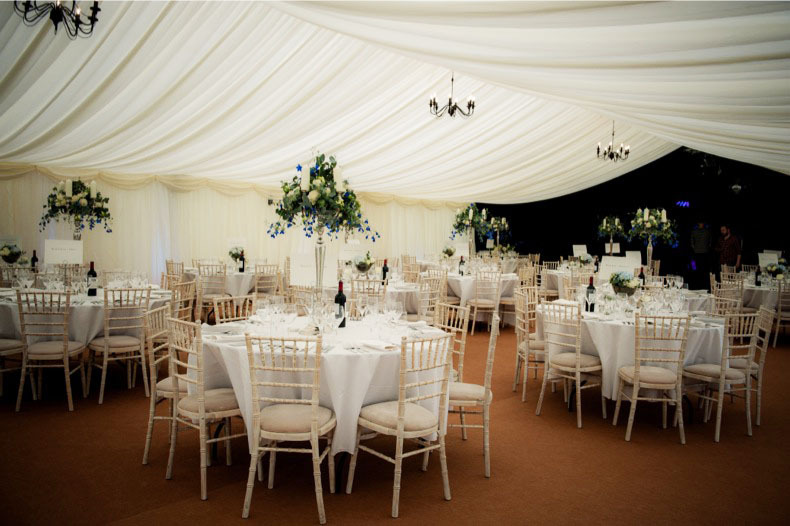 This area of marquee hire is often neglected by other companies, and it is a requirement that must be complied with. 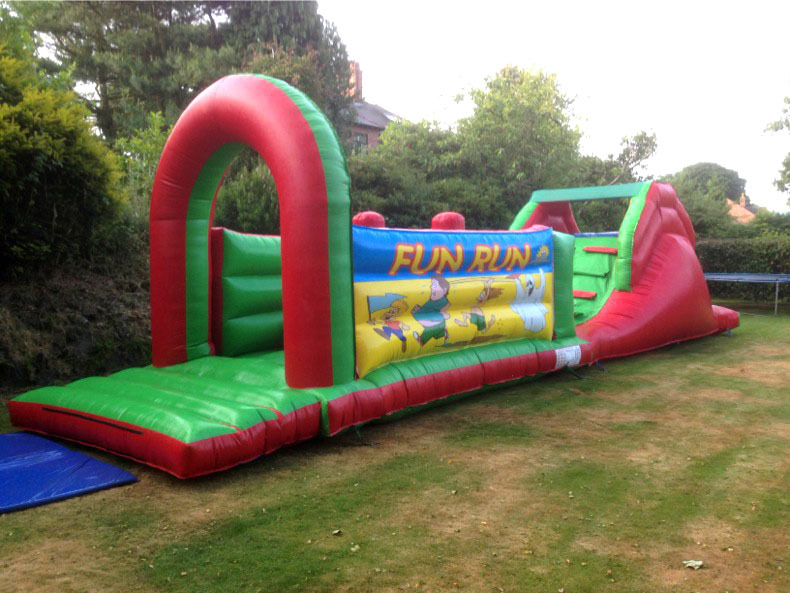 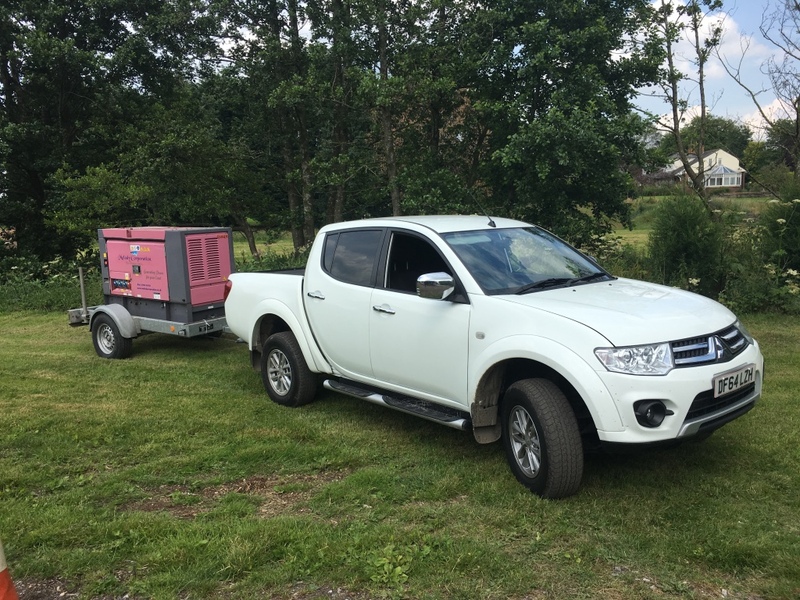 For the fun element we can supply childrens games, fairground rides for children and adults, and various other entertainments. 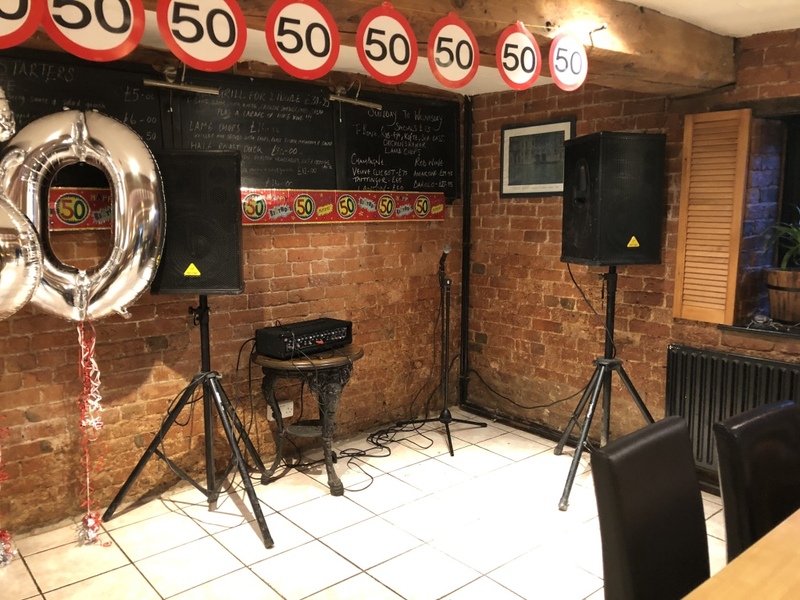 To ensure that everyone hears the speeches we can supply a PA system. 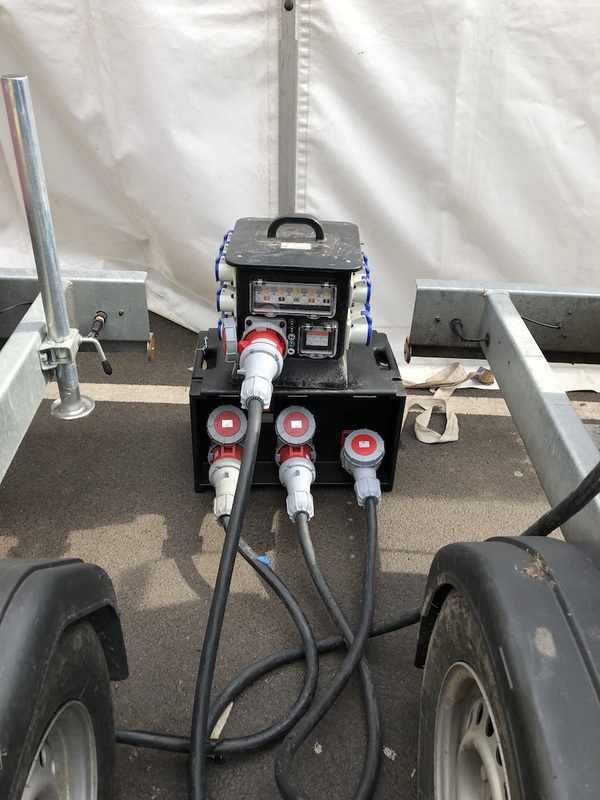 This includes amplifier, microphone and speakers. 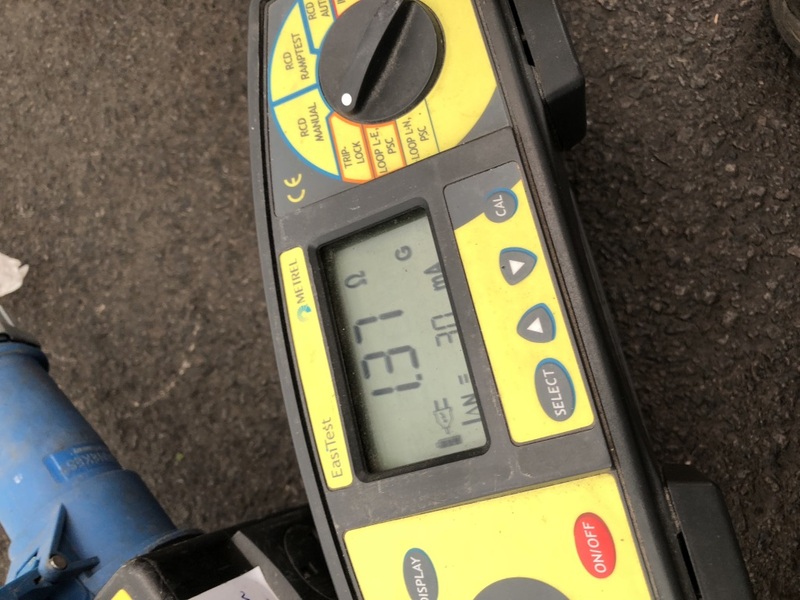 If you require a cordless radio microphone there is an additional charge. 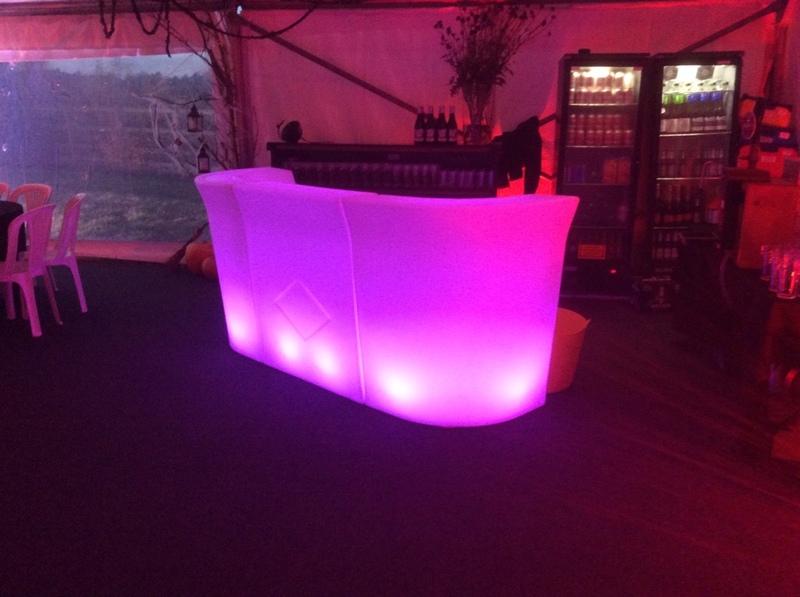 Banish the cold as your event hots up with some of our thermostatically controlled indirect heating systems! 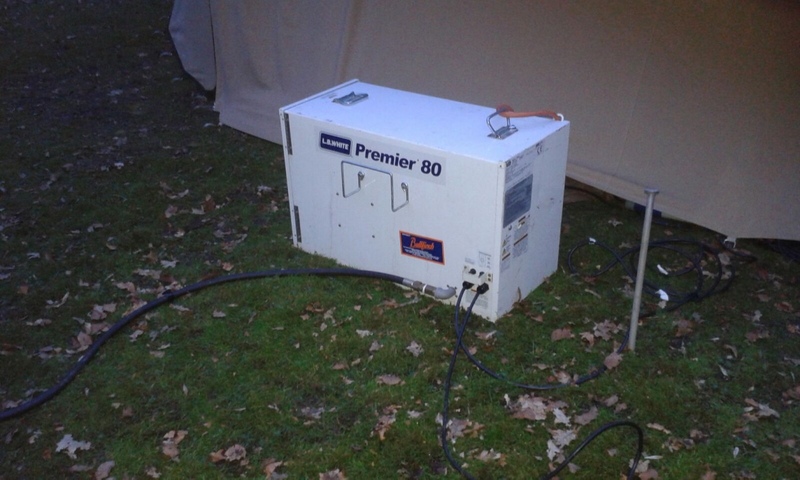 The marquee heating systems are delivered, installed and tested by our experienced operators. 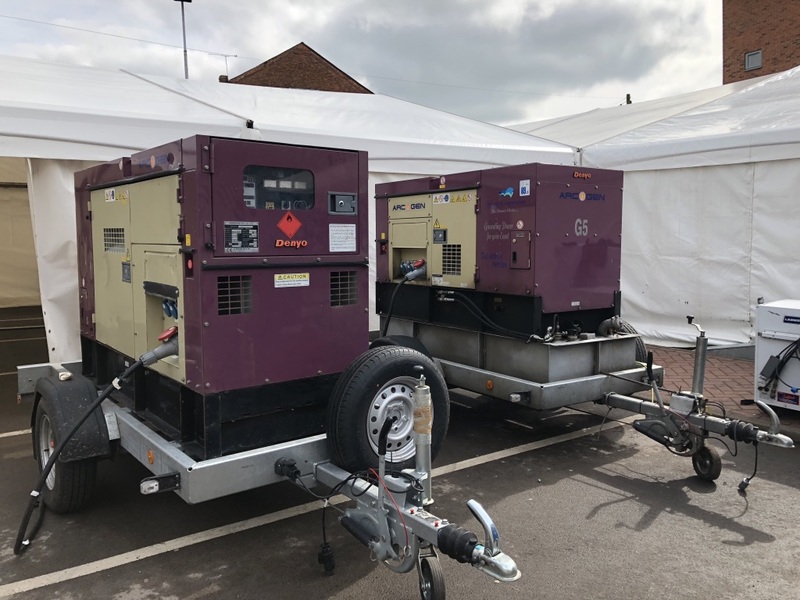 They will also demonstrate the use of the heating systems to the customer. 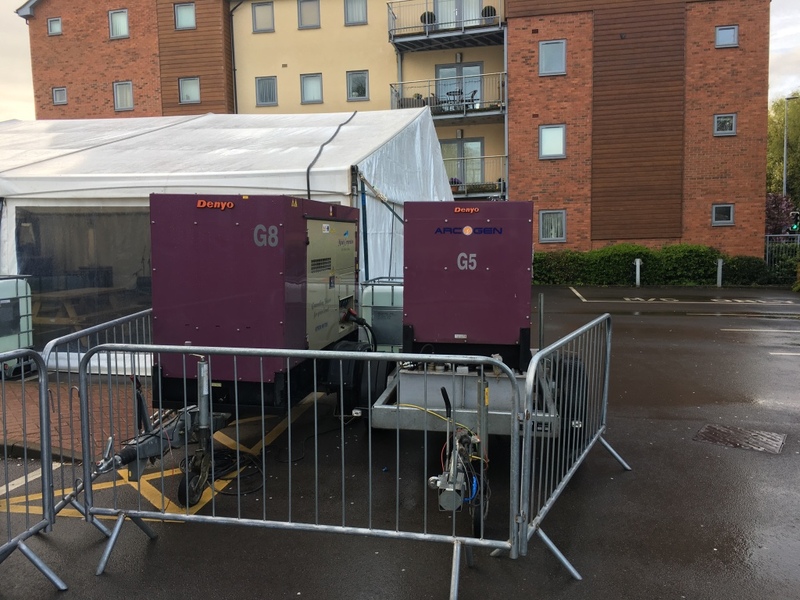 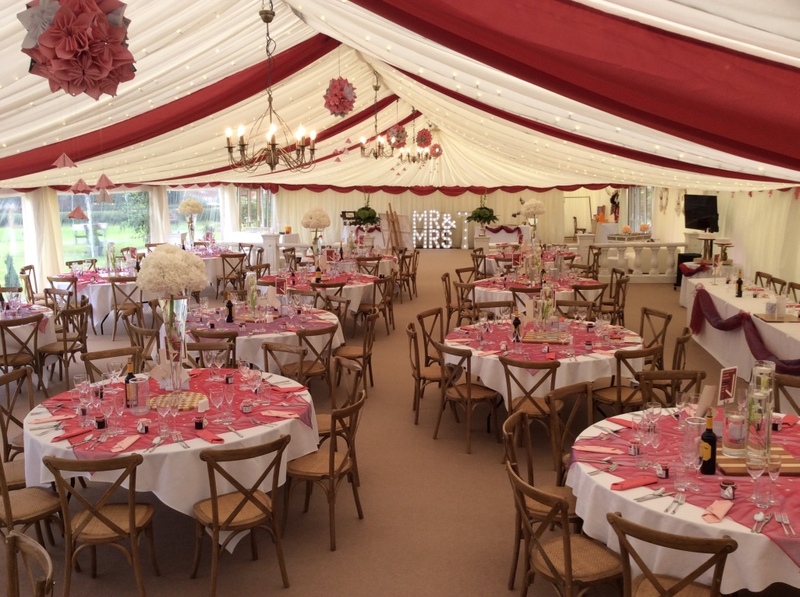 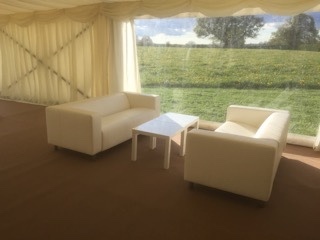 Our purpose-designed air diffusion system (pictured below) allows the heating to be tastefully installed beneath and attached to the marquee lining - ideal for even the most elegant event. 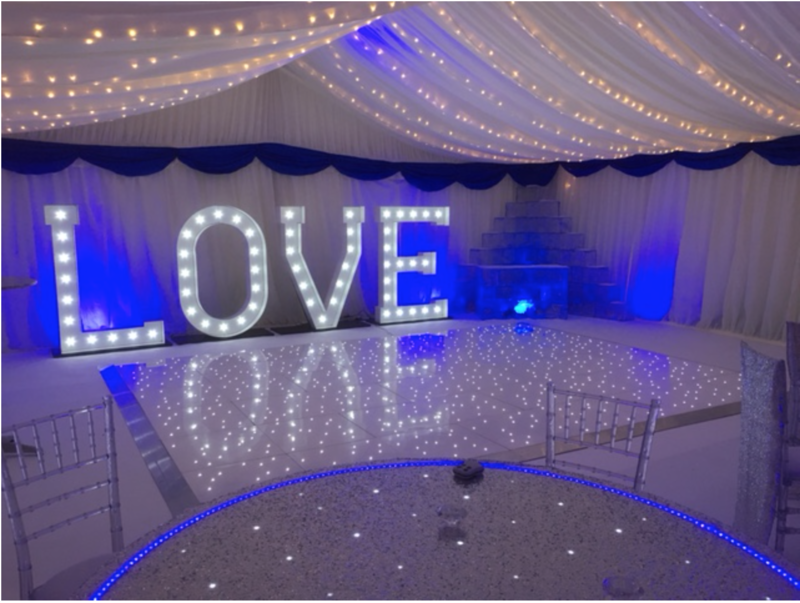 The most popular lighting in marquees are the traditional chandeliers which are individually switched and on dimmers. 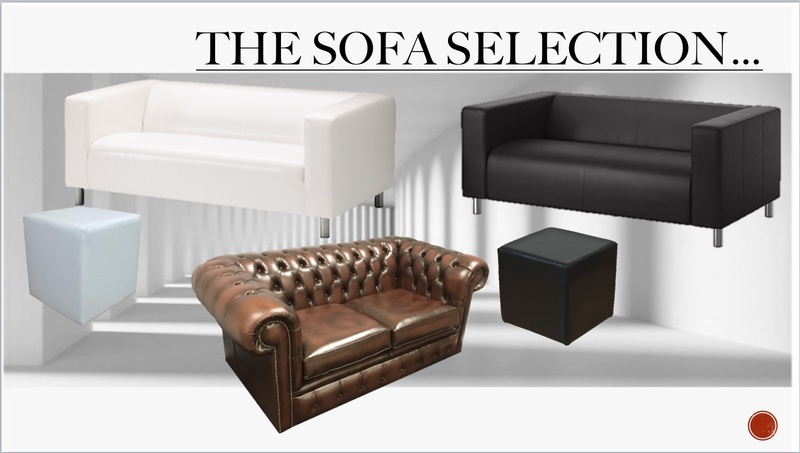 These are perfect for the daytime, and in the evening you can be selective and have on which you require. 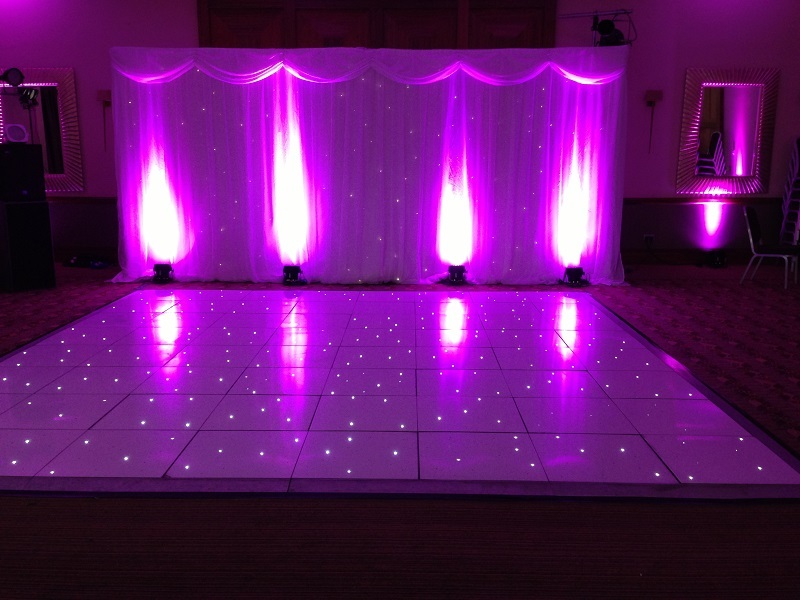 You may also consider uplighters behind the linings which create a lovely warm atmosphere. 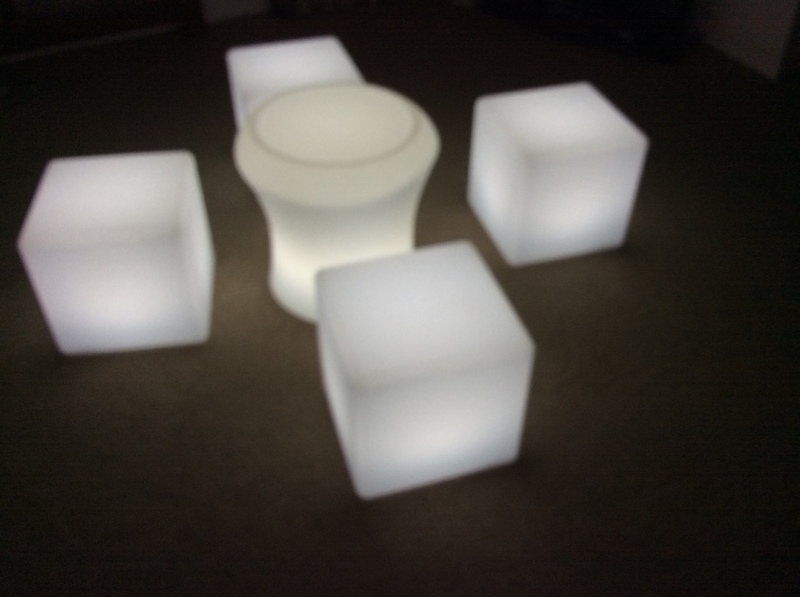 Either a basic white light or create more feeling with a set of colour changing uplighters.These are a soft colour changing light, from red, to blue, to green, to yellow and back again. 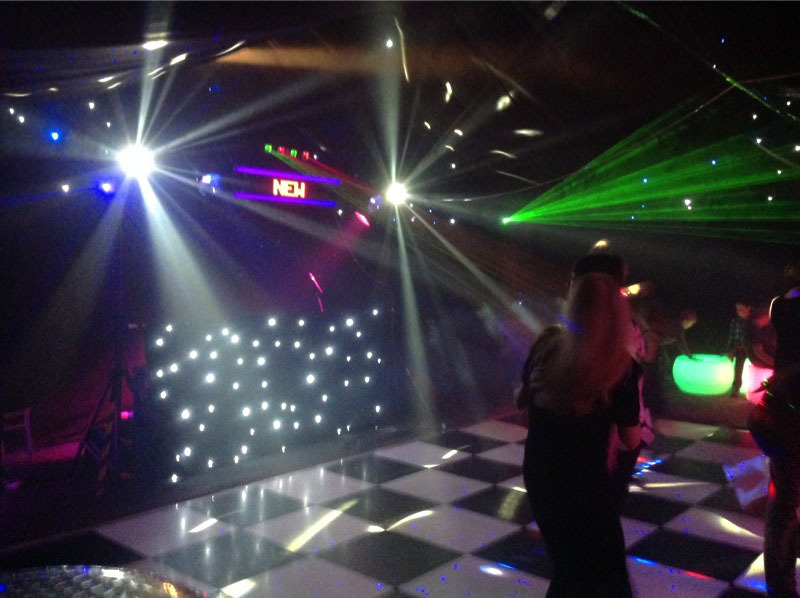 Or a truss with pinspots and floods shining down. 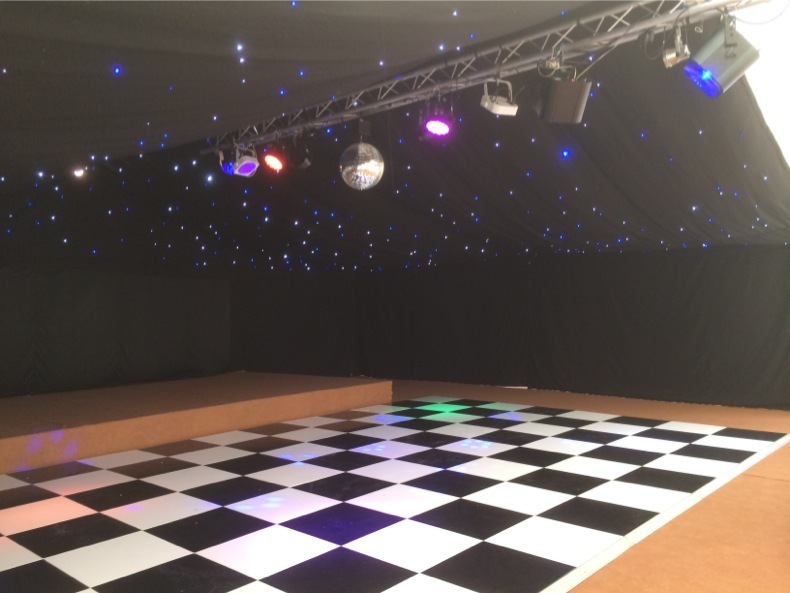 This is a superb addition to the finishing of any marquee, transforming an already fabulously lined interior into something that little bit more special, creating a perfect atmosphere to dance the night away. 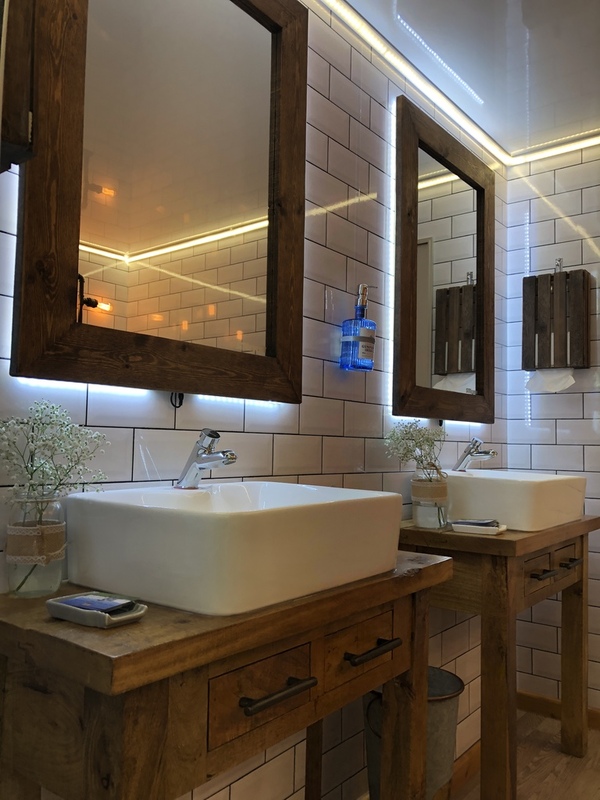 Depending on what lighting is available on your chosen site will depend on whether or not you require outdoor lighting. 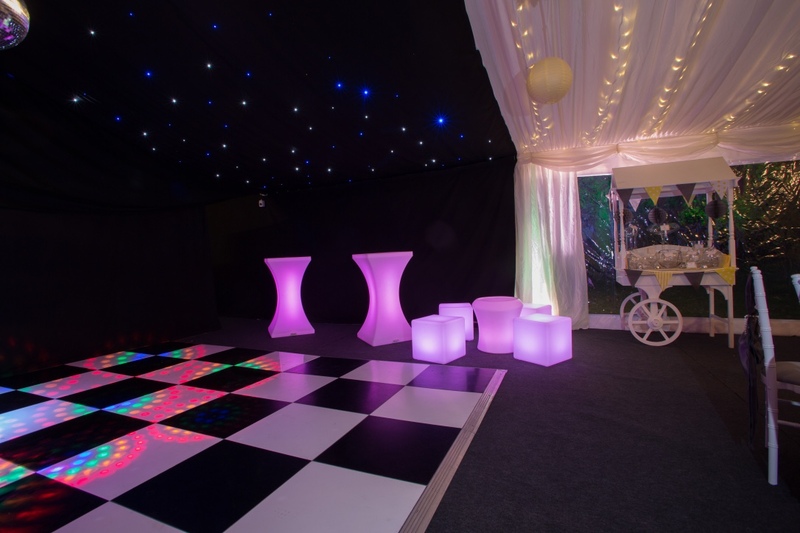 Safety of your guests must be considered and we can provide various outdoor lighting. 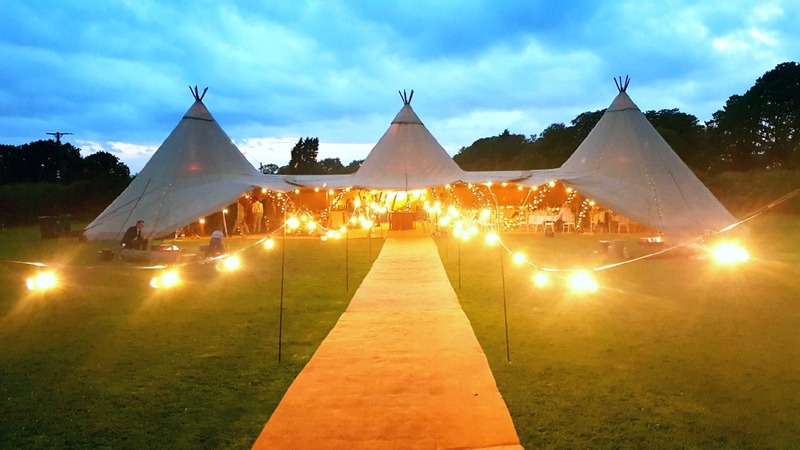 You may decide to have a pair of twin head lamp posts situated either side of the entrance, creating a warm and inviting welcome for your evening guests. 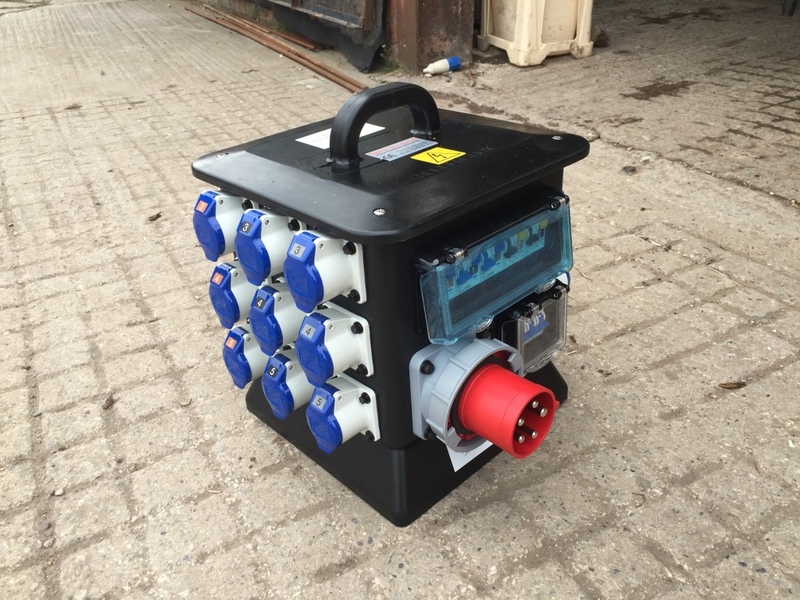 In addition, we can supply twin headed security/floodlights. 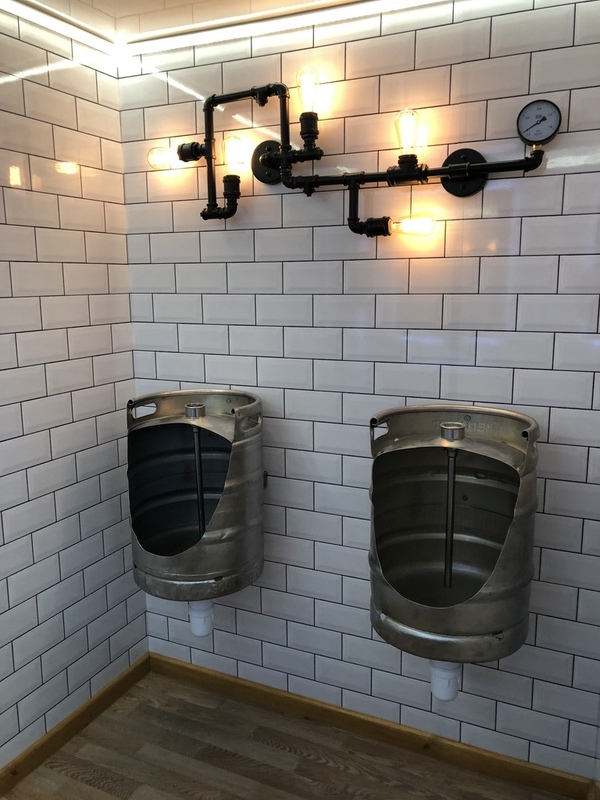 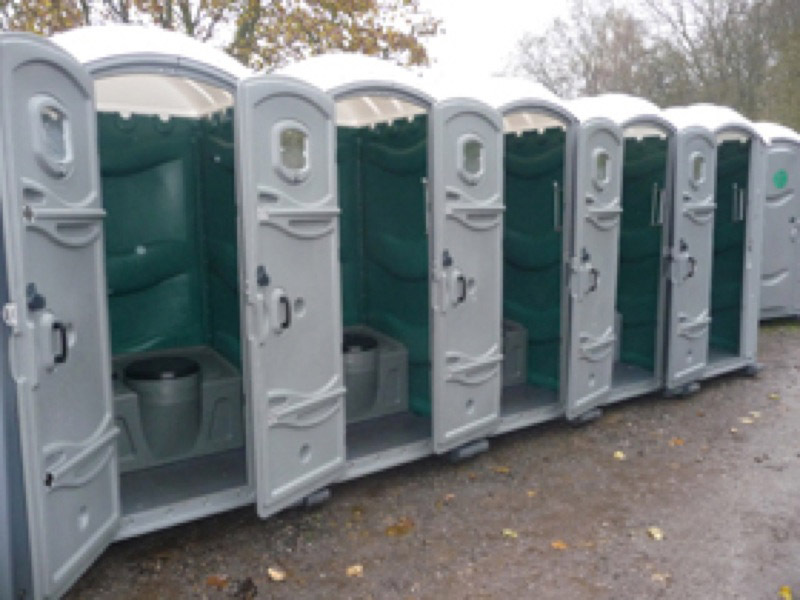 Depending upon the type of event, will depend on the standard of toilets that are required. 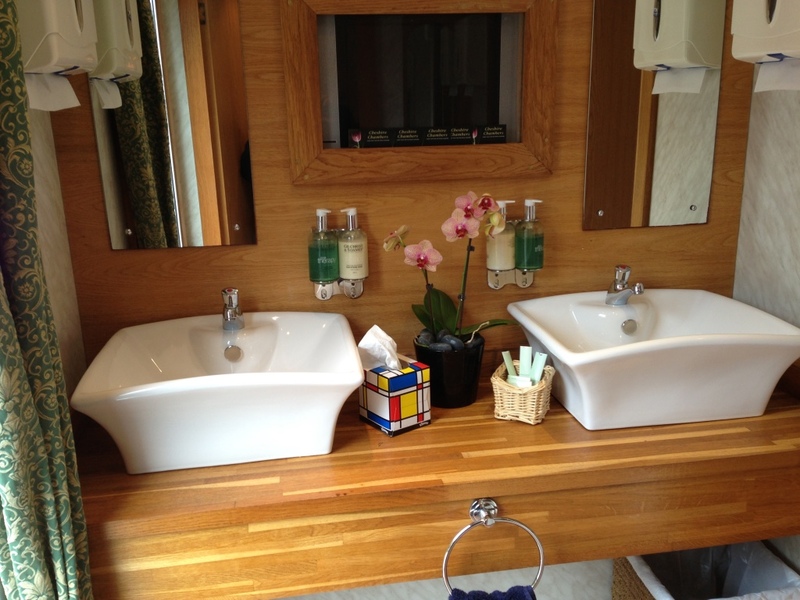 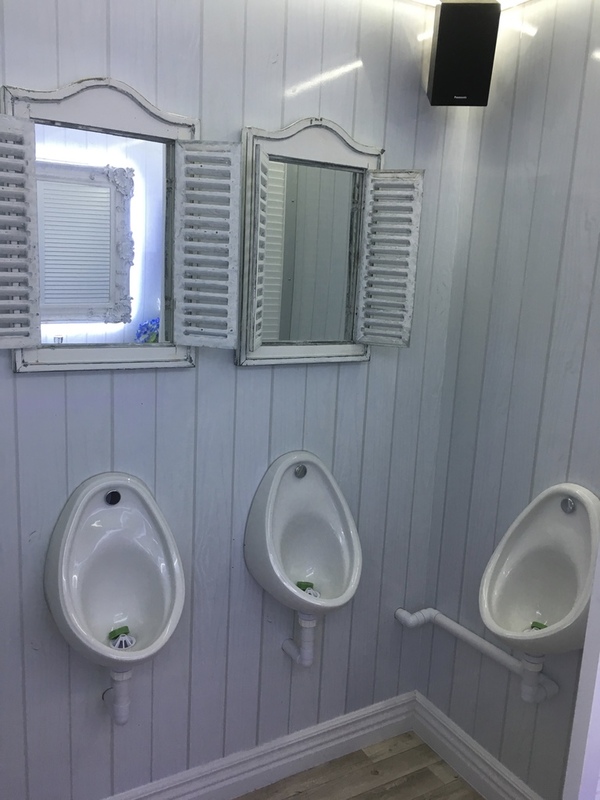 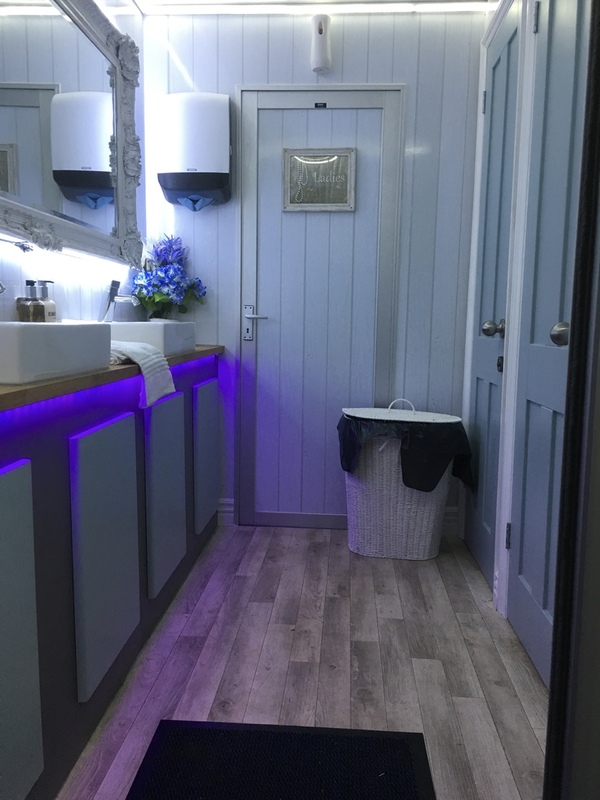 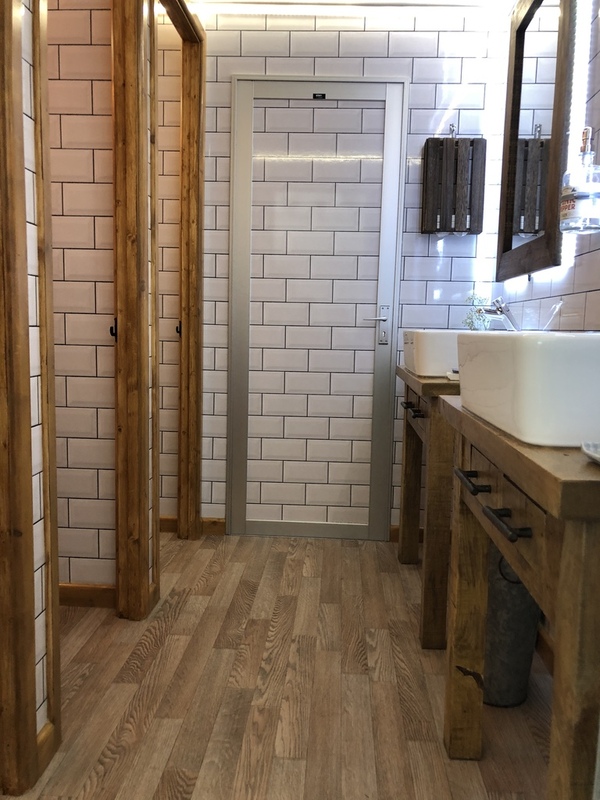 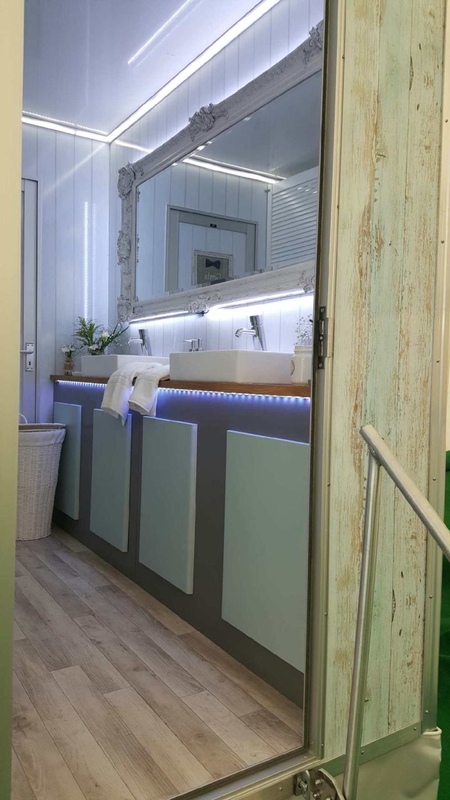 We can provide single portable toilets to luxury toilet units. 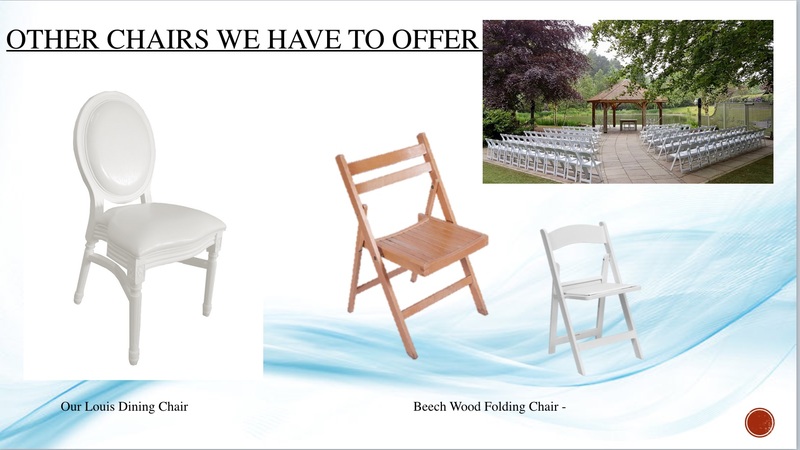 If you cant find what you are looking for on our website, drop us an email and we are sure to be able to help. 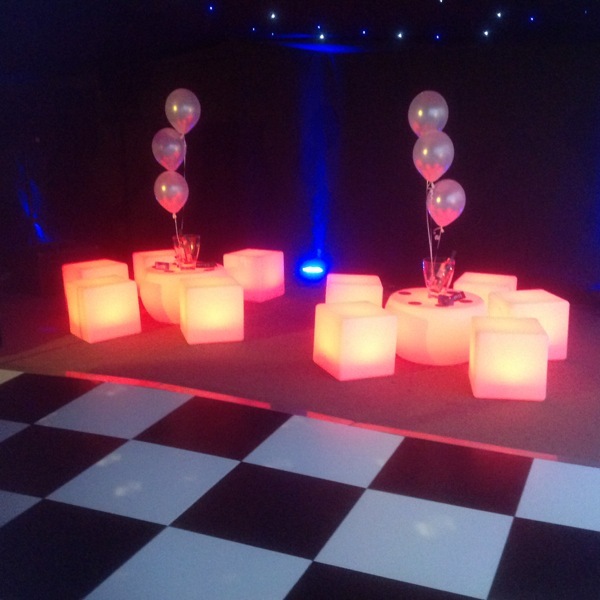 We offer a service second to none for events and special occassions. 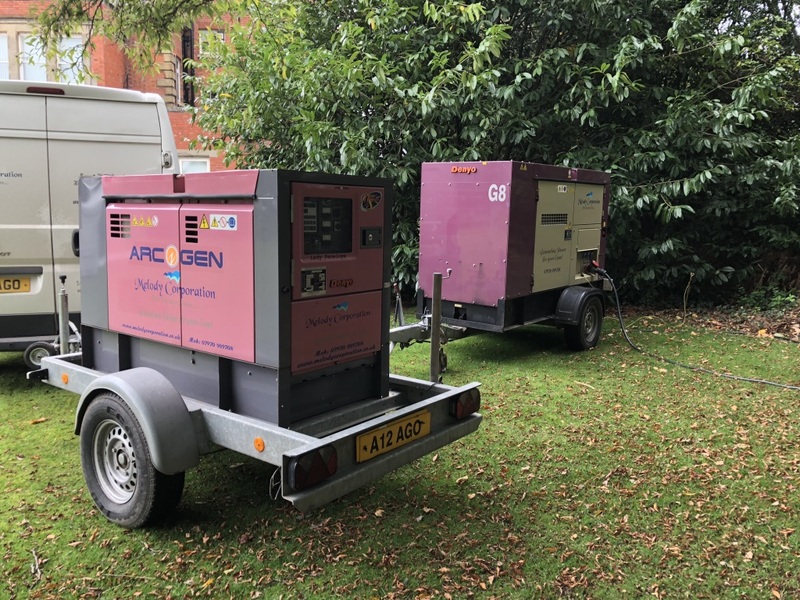 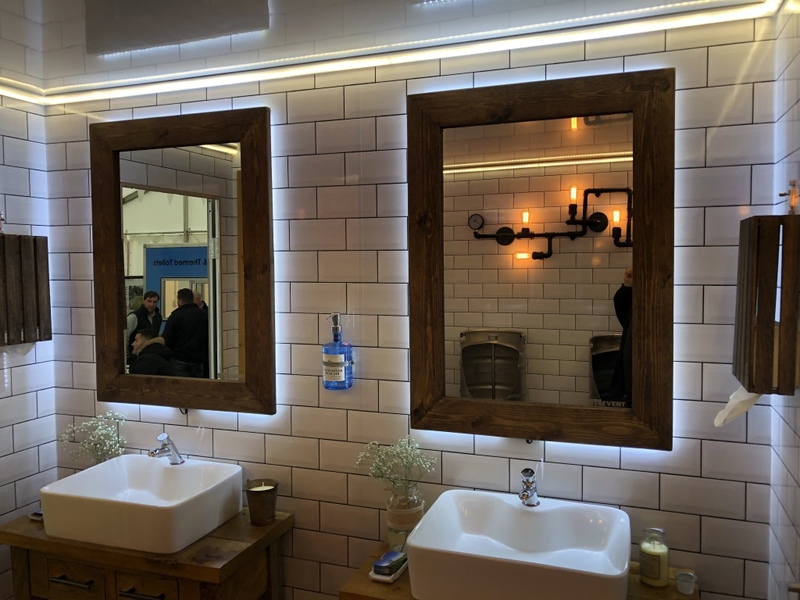 We offer a complete service which complies with BS7909 (Electrical legislation for outdoor events) and you will receive full certification on completion of our works if required. 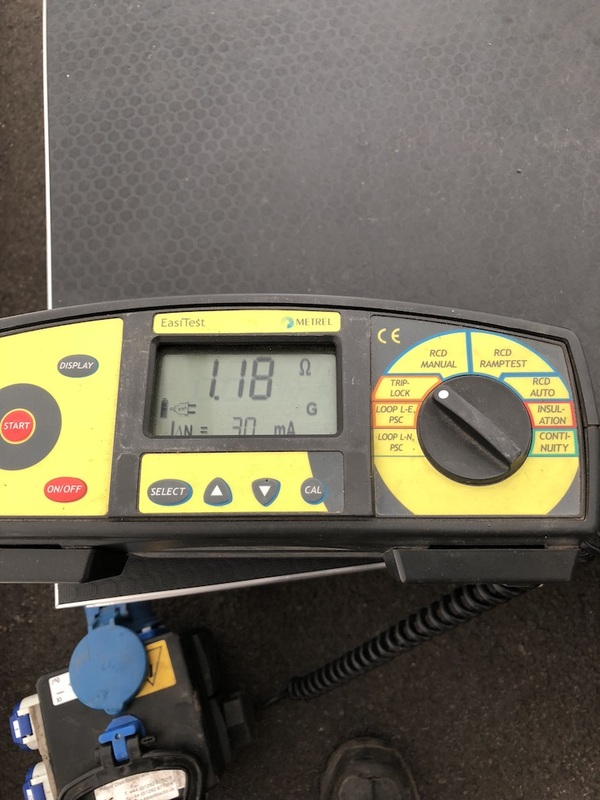 Many companies do not offer this, or if they do it may not be the full certification. 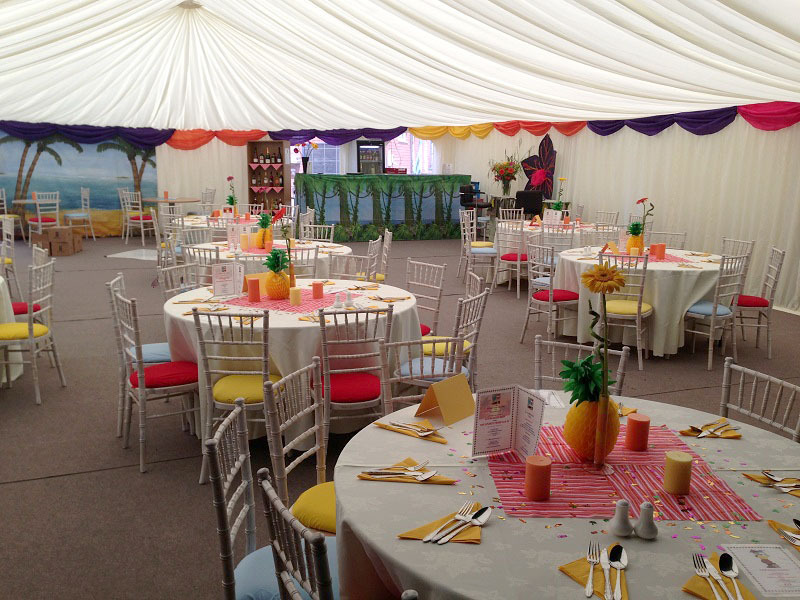 Like all other industries, the leisure and events sector must comply with certain guidelines. 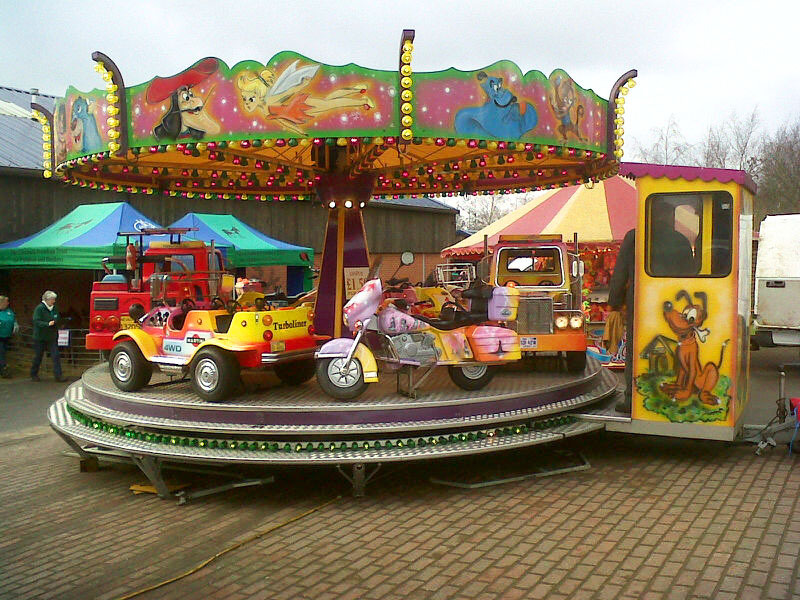 Failure to do so, should something go wrong, could result in the event organiser being held for negligence. 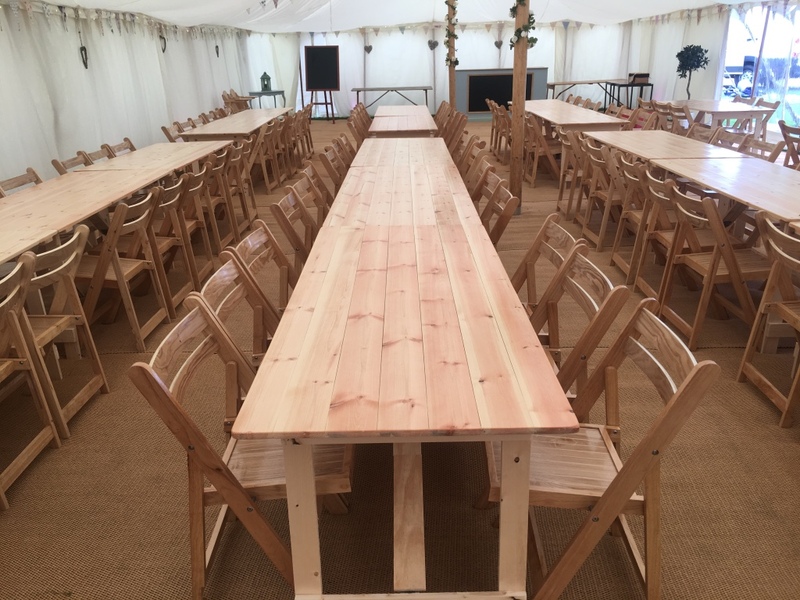 Size of event or celebration is immaterial. 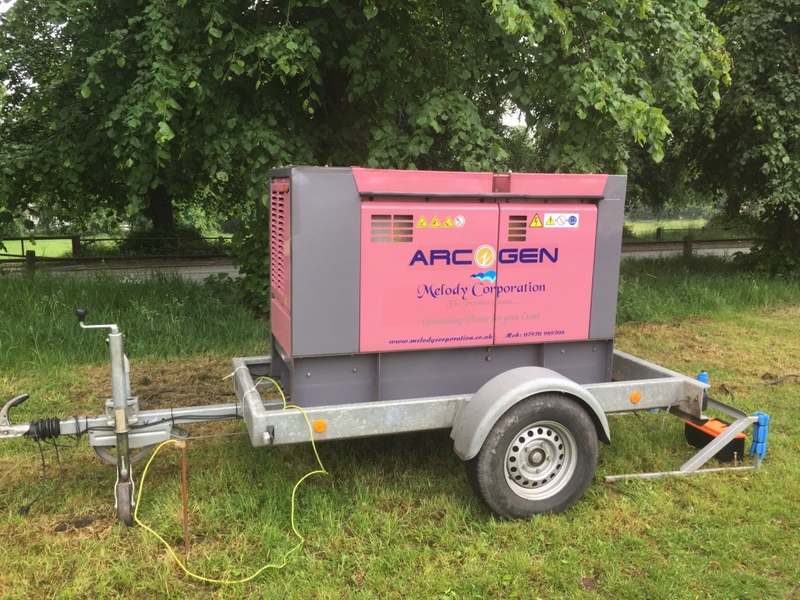 It is anything from an event in a back garden, to a music festival. 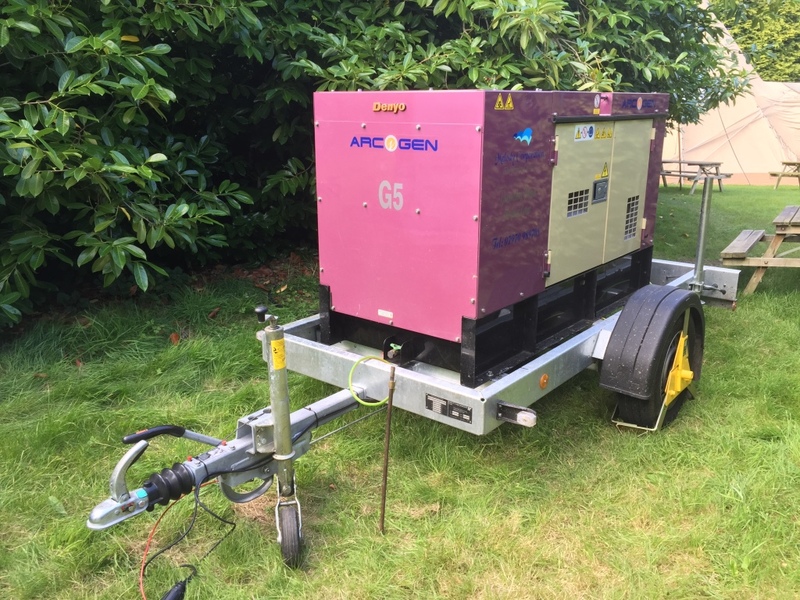 If electrics are involved there are certain guidelines to follow. 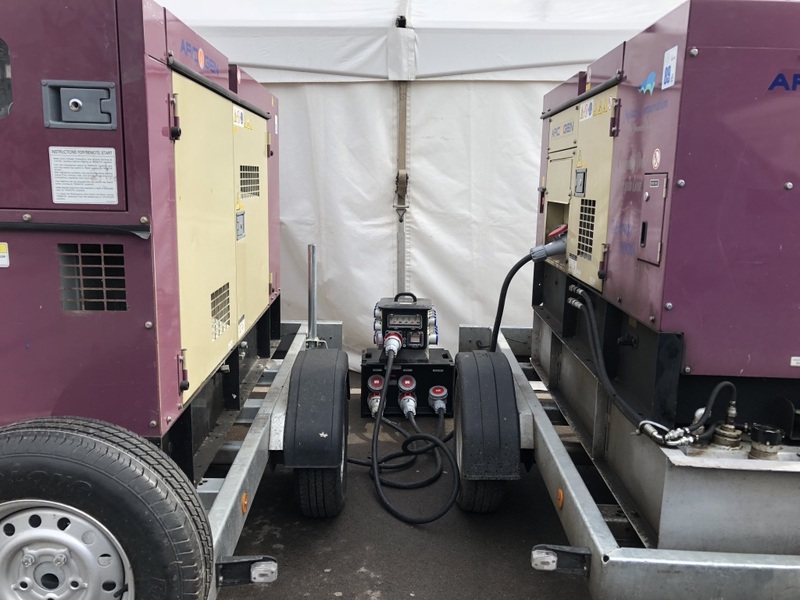 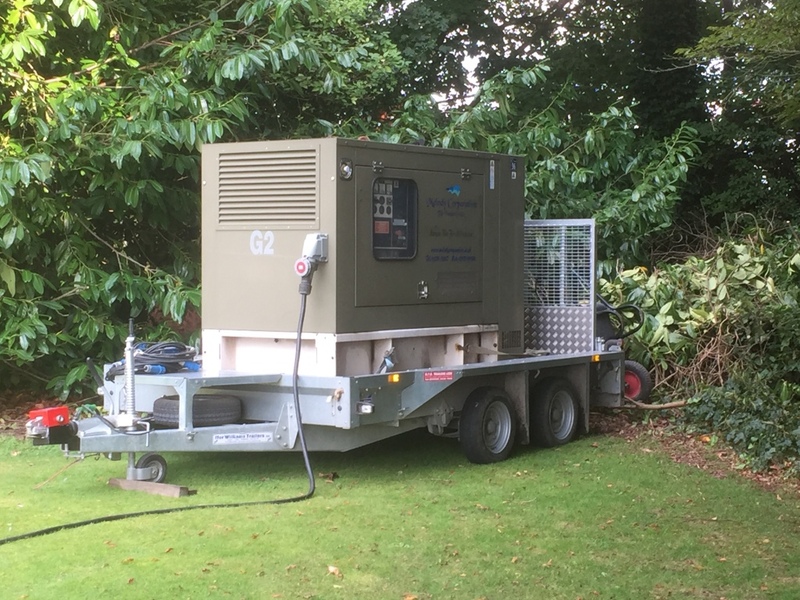 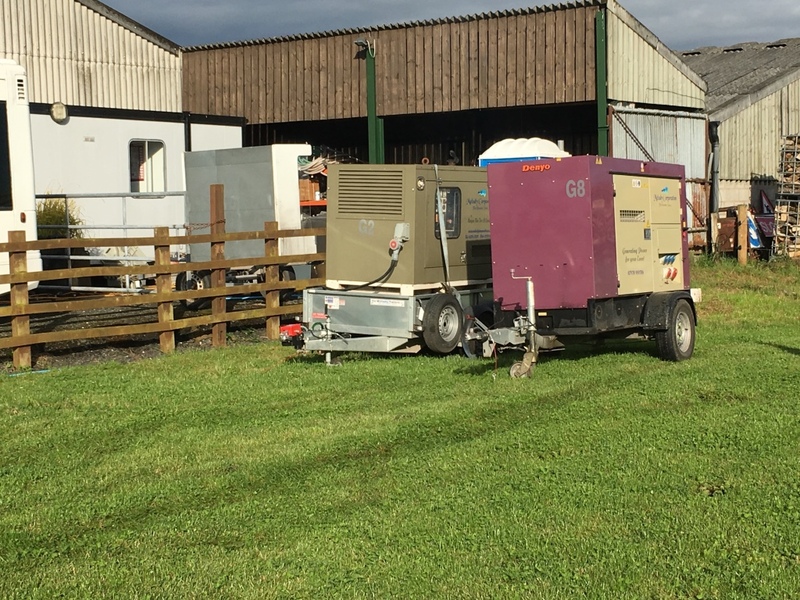 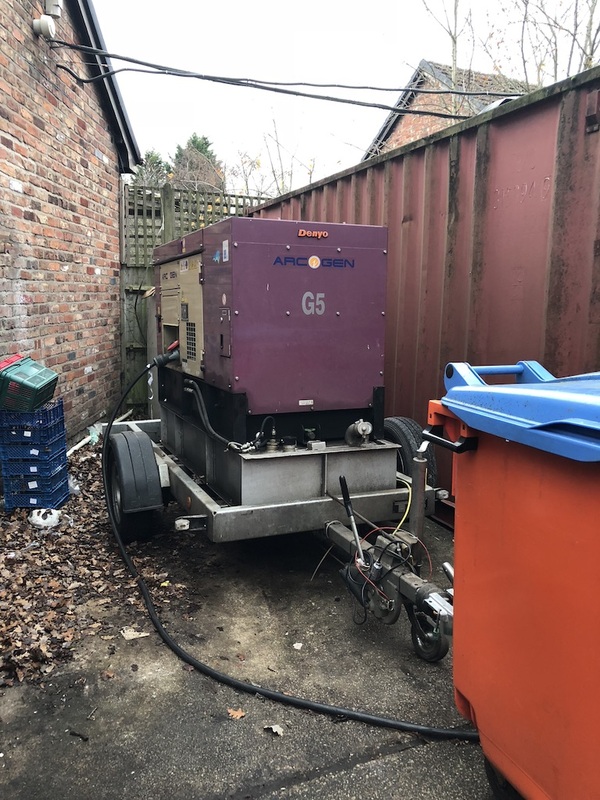 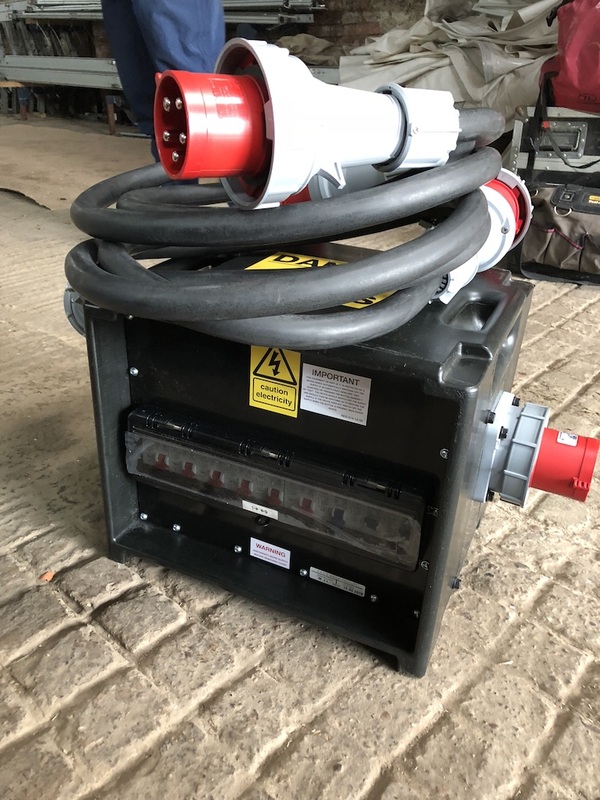 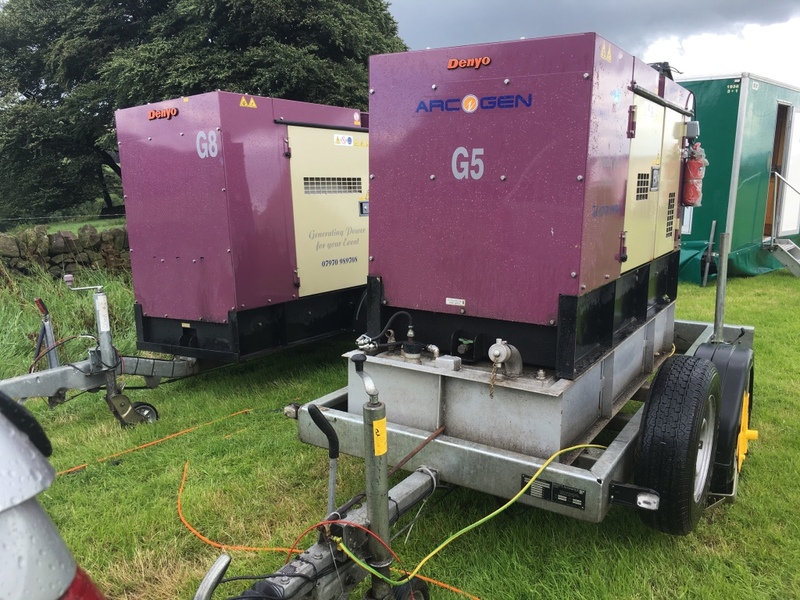 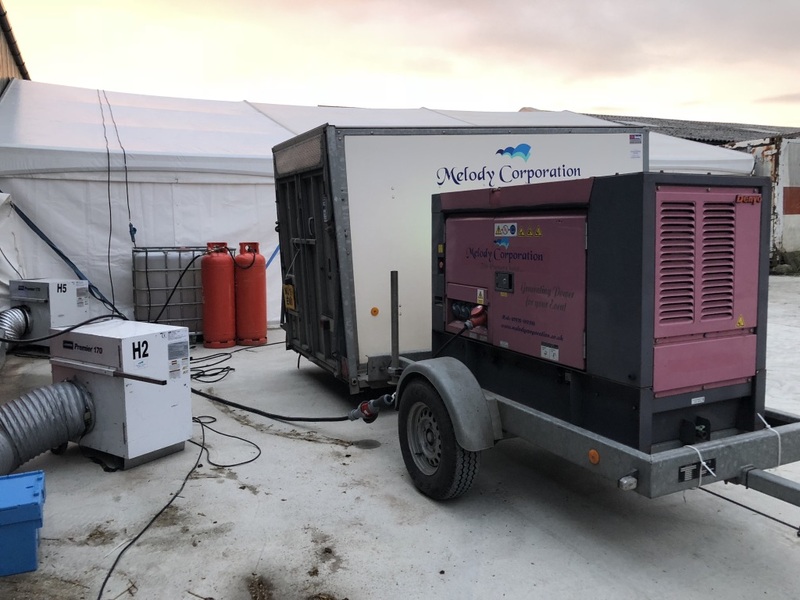 All our heaters are gas (But do also need an electric supply to operate) and are much more efficient than the traditional diesel/oil fired marquee heater. 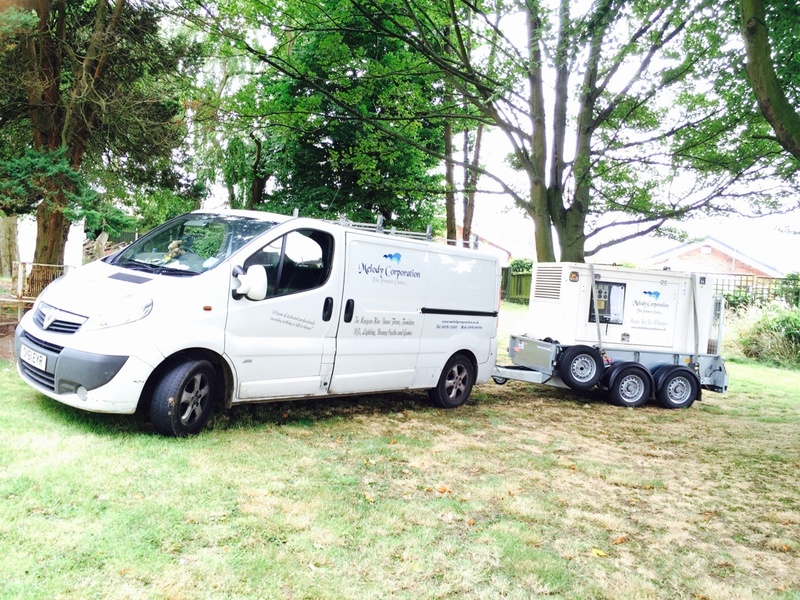 Gas is much cleaner to work with on site, meaning no spillages of fuel causing contamination on grass etc. 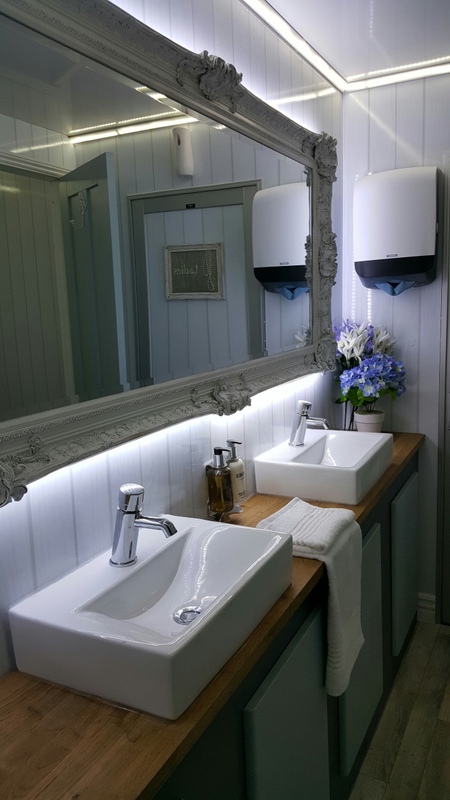 Heat is virtually instant with these heaters unlike the oil fired which blow cold air in for a time until the air is heated. 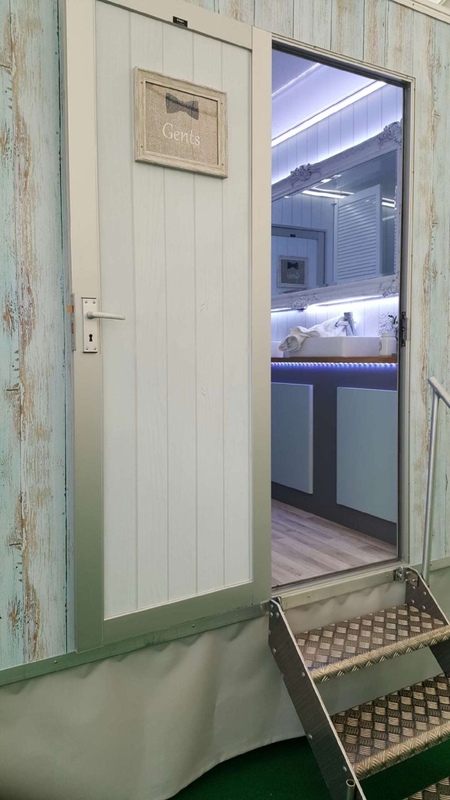 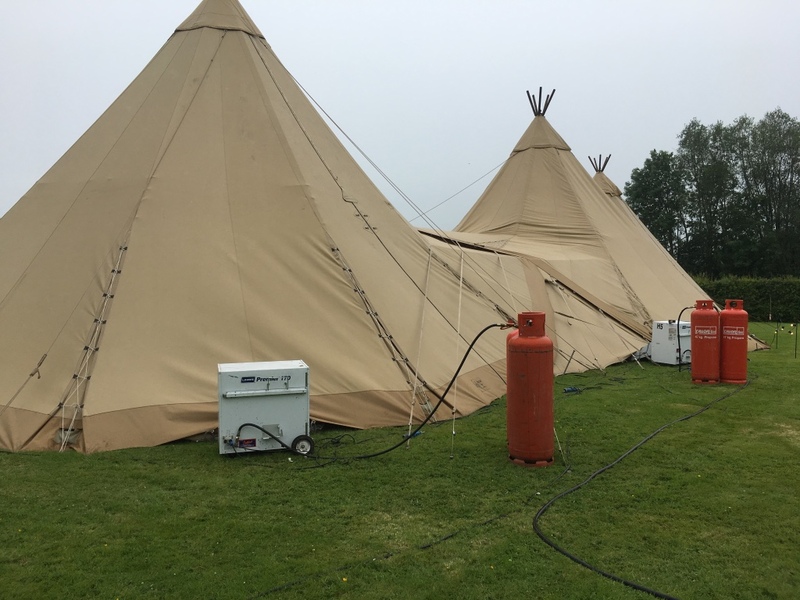 The heaters work by being positioned on the outside of the marquee/Tipi and heat up air from the outside and blow it in through a ducting system. 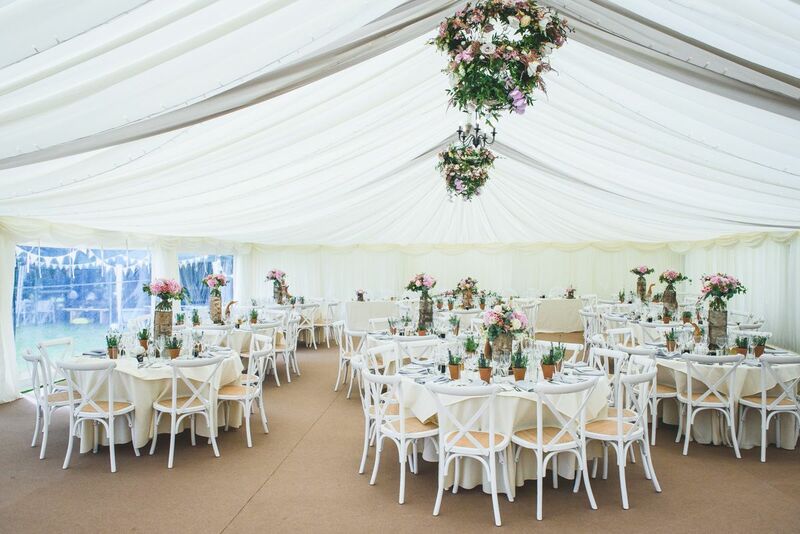 You can’t under any circumstance position these, or indeed oil fired heaters, inside a marquee.